This weekend I had the opportunity to meet up with some of Michael’s colleagues in a park. Not just any park, though. 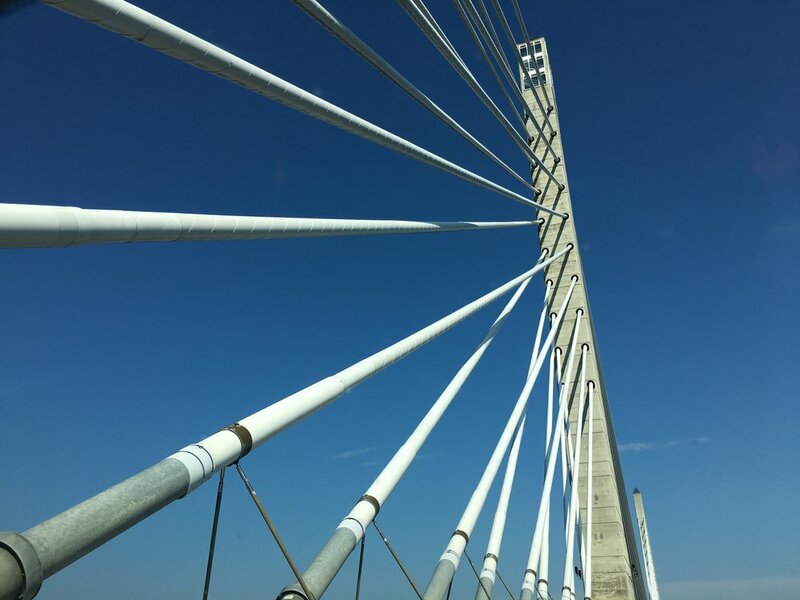 Each week, I would hear Michael say, “I have to go to Roebling tomorrow.” I never knew where that was, and sometimes only half-listened to the details on what he was doing there. 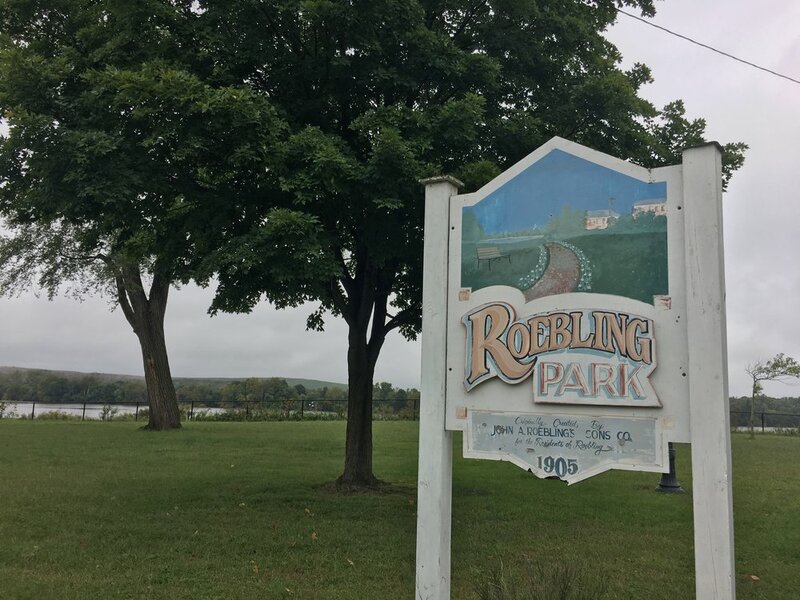 But on Saturday, I learned how the area in Florence Township, NJ, had been the site of accumulated waste from the John A. Roebling's Sons Company that made steel and wire products. John A. Roebling’s steel had been used to build the Brooklyn Bridge, among others. 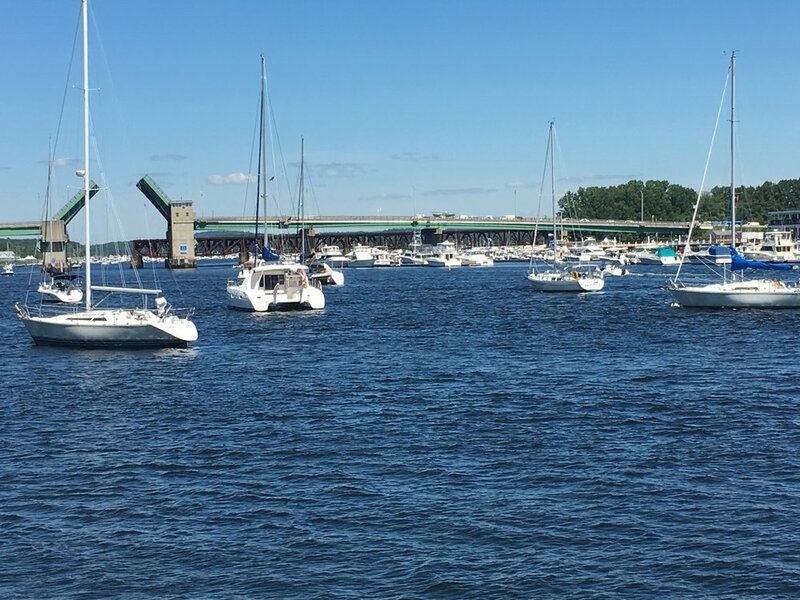 The Environmental Protection Agency received feedback from area residents indicating a strong need for public access to the waterfront. 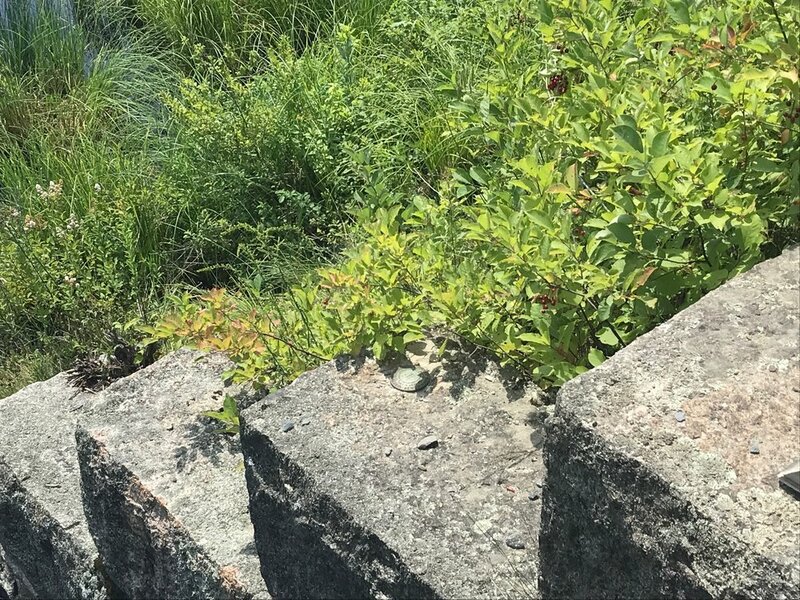 CDM Smith was involved in the site remediation and transformation of the piles of dirt into a beautiful park overlooking the water, with Michael overseeing some of these plans. 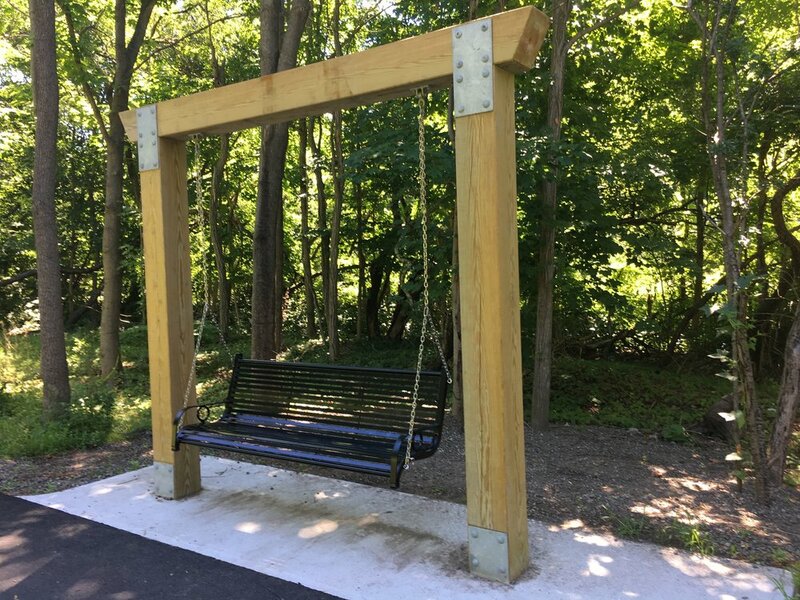 My thanks to Stephen Mirabello and Jeffrey Rakowski for spearheading the effort to have one of the benches dedicated to Michael, and for organizing the get-together. I only have one regret. I wish the park was closer for me to enjoy on a regular basis. 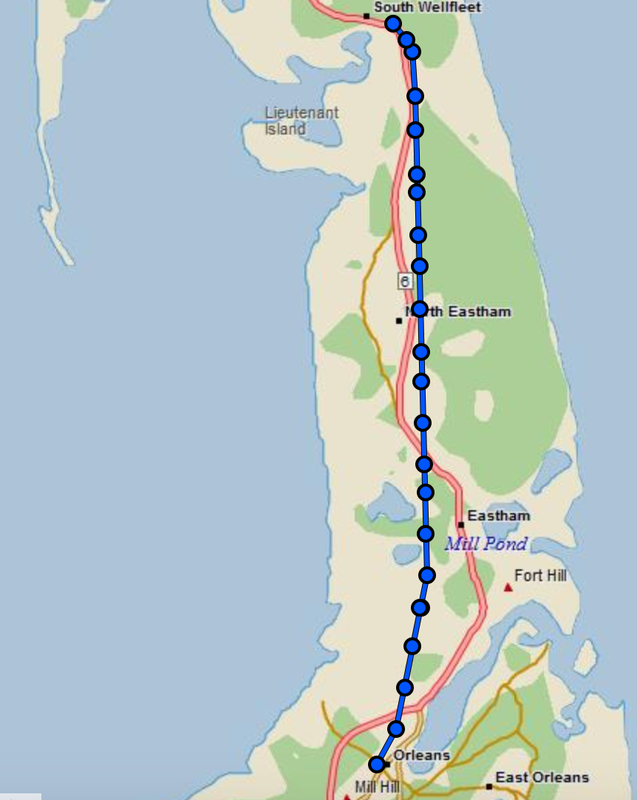 My walk along the East Coast Greenway wrapped up yesterday with a short leg to Gouldsboro, Maine. Right now, as I pause in writing this post, I'm staring at a small pile of clothes that I have been wearing for the past two months, and I am giddy about stuffing them into Lucy, my giant backpack, for one last time. In a few short hours I will be home. But let me catch you up on the past few days. 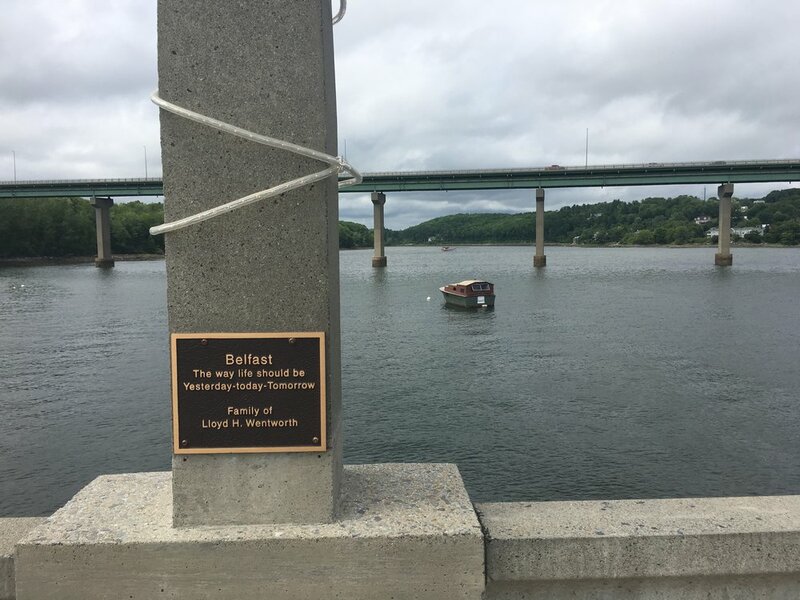 The Ellsworth to Franklin trip on Monday was along the 87-mile multi-use Downeast Sunrise Trail that runs parallel to Route 1. There are no cars or trucks, but you do need to yield to an occasional ATV, which can kick up dust from the trail, depending upon how fast its driver is traveling. There is hardly any shade, and little opportunity to sit while you hydrate. However, thanks to the virtual Cadillac to Katahdin race in which I participated, I met Barbara. She walked the ten miles with me to Franklin, and her husband was there to pick us up. 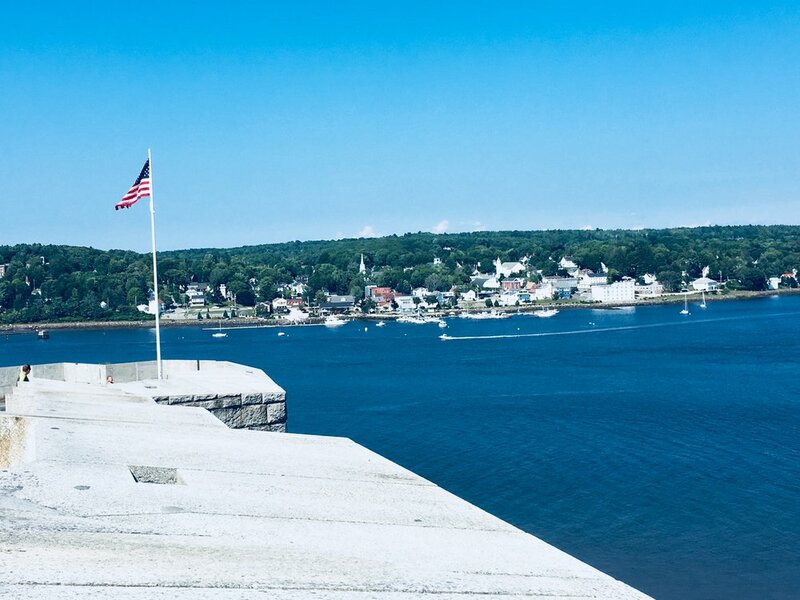 I was fortunate to spend two relaxing and enjoyable nights in their lovely home overlooking Frenchman Bay, with views of Cadillac Mountain. They spoiled me, and served me lobster caught that very day! My second day on the Downeast Sunrise Trail led from Franklin to Tunk Lake Road. 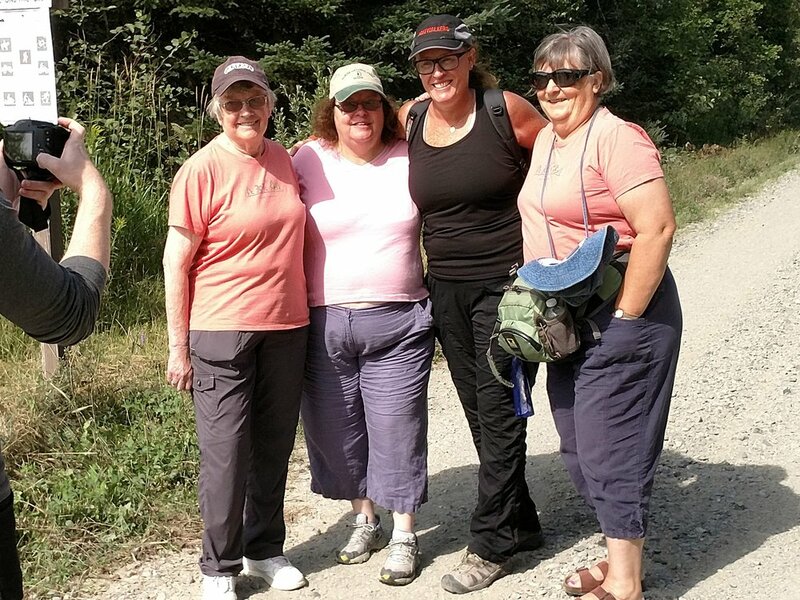 Not only did I get to spend time with friends Billy and Charlie who were vising from home, but I got to meet the Sole Sisters of Sullivan, a local women's walking group who would keep pace with us for the first dusty mile. Thanks for coming, ladies! After the Sole Sisters turned around, Billy and Charlie and I, along with Argos, continued on. 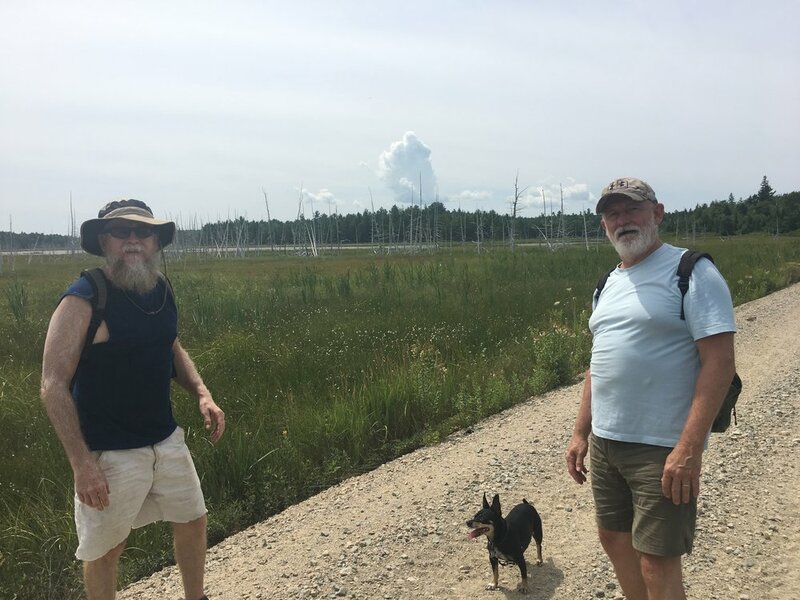 It's a long, hot trail, but I was encouraged when there was an opening in the trees, and I realized we were walking right next to Schoodic Mountain. The same mountain that made me catch my breath when I was only approaching the Penobscot Narrows Bridge almost a week ago. We were happy to see the car at Tunk Lake Road, and fired up the A.C. in the car. We then stopped for some Gifford's ice cream before we did a tour of Schoodic Peninsula. 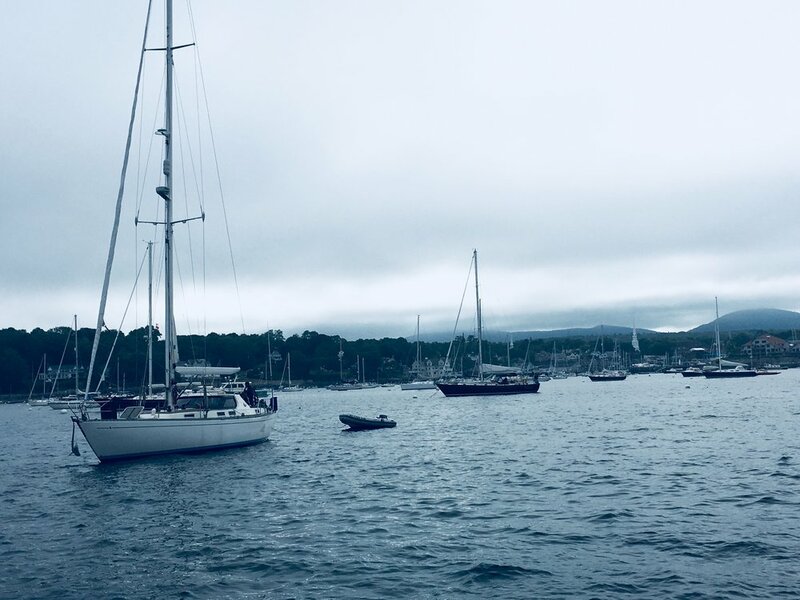 Our crew headed down the peninsula, with a stop at Raven's Nest, Schoodic Point, and more, topped off with another delicious meal at The Pickled Wrinkle. The very last day of my two-month journey was spent walking on Route 1... again. However, it was only a short distance from Tunk Lake Road to my destination. Barbara, who joined me again, took us on a detour onto Grange Hall Road for a short break from heavier traffic. 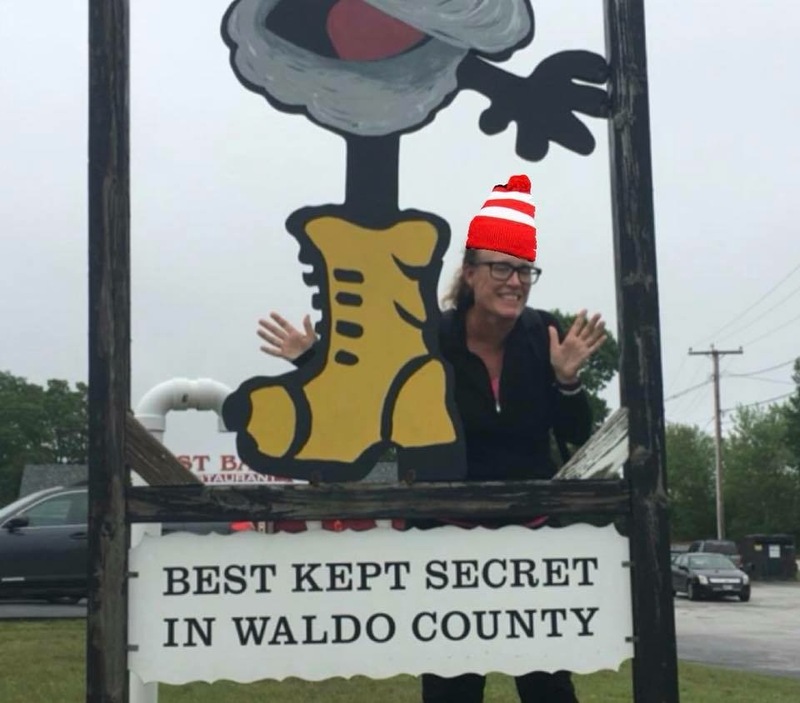 And then there I was, standing in front of my final destination, the gateway to the town of Gouldsboro. Barbara and I hugged and high-fived, and then it was almost anticlimactic. That is, until Don came to pick us up. He stepped out of the car with a lovely bouquet of flowers that Barbara had picked from her garden that morning. And then tears flowed. I had originally wanted to walk the last day by myself. But having my new friends there with me did make the moment more special, more real, and allowed me to just be. For that, I am grateful. Lyndon B. Johnson said, "Peace is a journey of a thousand miles and it must be taken one step at a time." I may have only reached a little over eight hundred miles, but I found some peace along the way. I also made new friends, and strengthened bonds with current friends and family. And I hope I've made a difference by raising both money and awareness about two groups that bring people together in the outdoors. 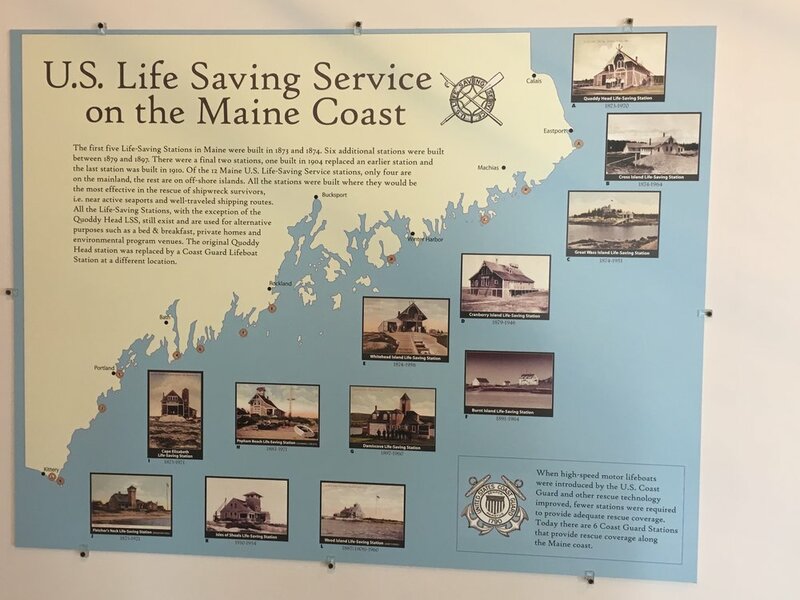 The next leg of my journey was filled with maritime museum history, forts, and time spent with family from states near and far. The morning I was to leave Rockland was grey and threatened rain. 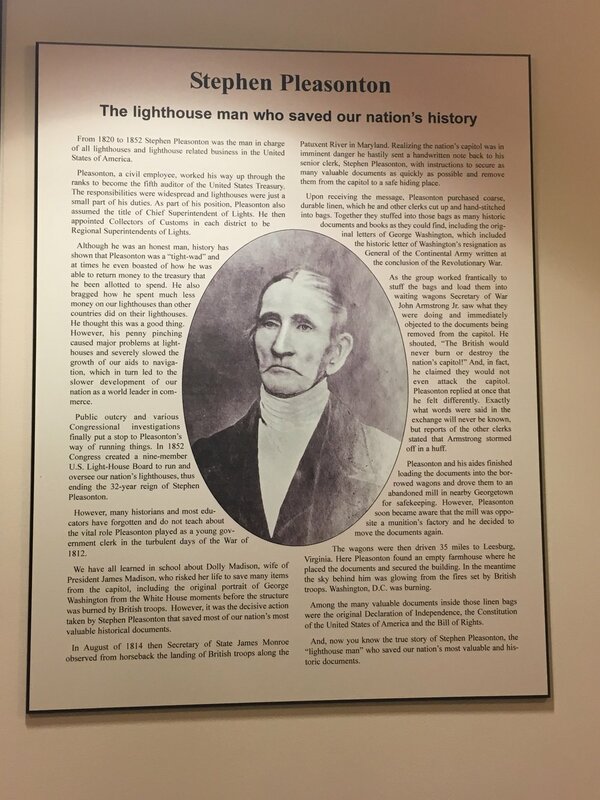 So I took the opportunity to check out the The Maine Lighthouse Museum. 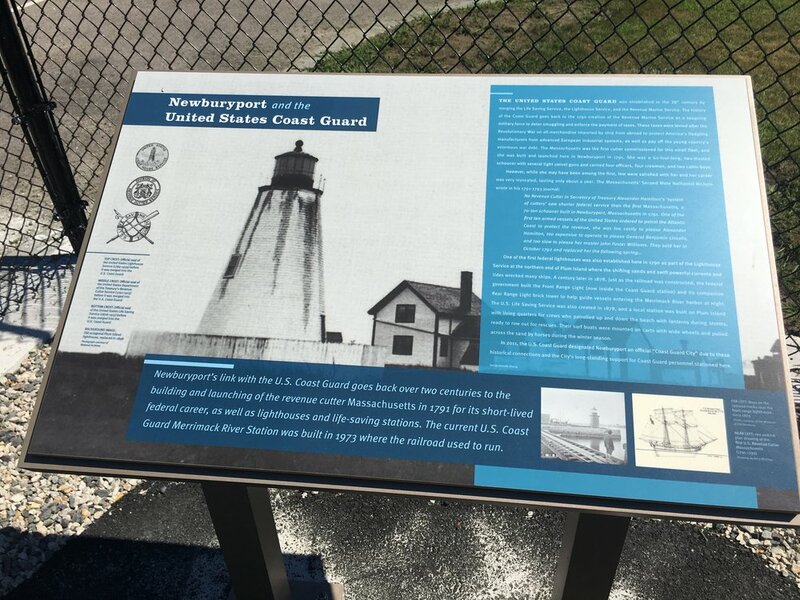 There is a large collection of pieces detailing the history of the U.S. Coast Guard, as well as lighthouses that line the state's coastline. The skies cleared a bit, but the humidity hung in the air. I strapped Lucy on my back, and started my walk to Camden, deviating from the greenway, and headed north on Route 1. 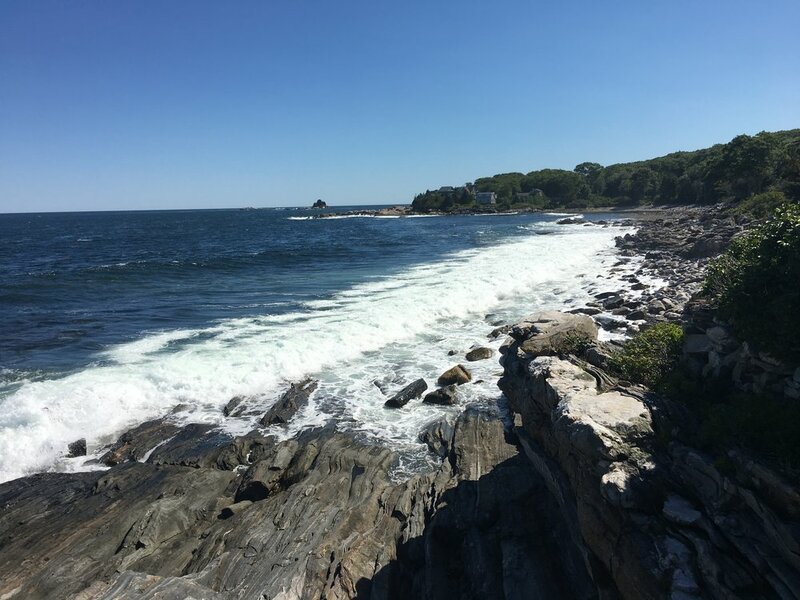 It was a relatively uneventful walk, with the exception of a drink break on a nice rock wall outside Downeast Magazine, and then the trip through the downtown area of Rockport. The sweaty stroll took me into the heart of Camden, and to my home for the next two nights, the Inn at Camden Place. 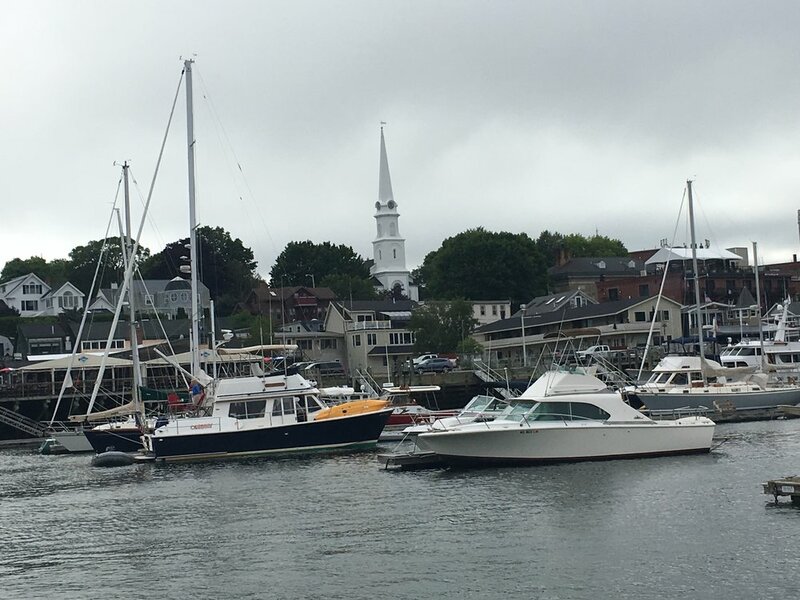 I would recommend this place to anyone who might visit this seacoast town; it is a five-minute walk to restaurants, shops, and the dock, and the rooms are extremely comfortable. I had a delicious pizza at 40 Paper, a higher priced Italian bistro just across the street, and called it a night. 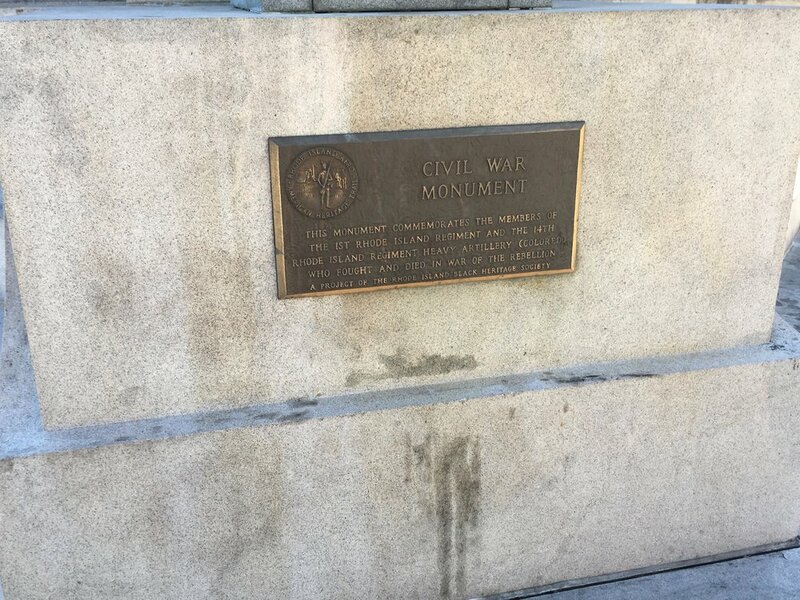 The next day, I decided to play hooky instead of walking the greenway to Clark's Corner, a route that promised to be nothing more than walking on streets with no sidewalks. I relaxed, and took my time leaving the inn to explore. 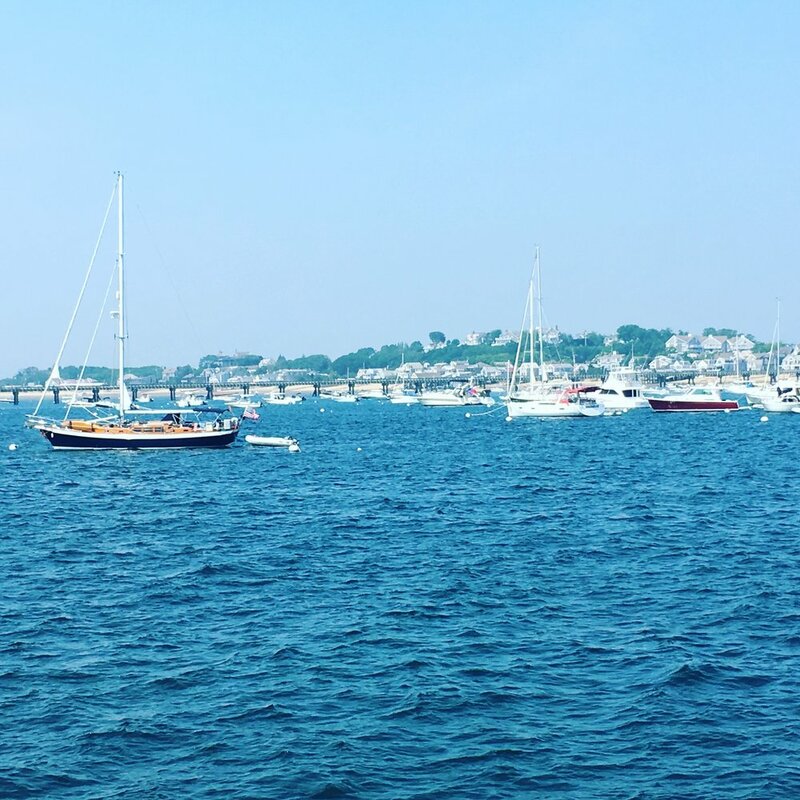 I ended up in the marina, perusing the itineraries of all of the boat cruises one could take. 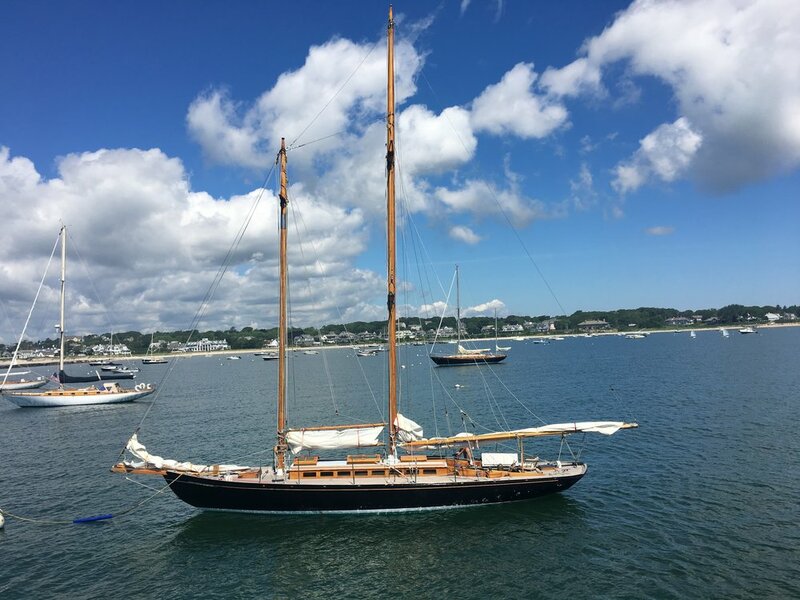 I met Mike, and we talked about the East Coast Greenway, and then I booked my spot for a two-hour tour on the Schooner Appledore, a two-masted wooden schooner. It was too foggy to see much on shore from the water, but it was smooth sailing with Chris, Jake and the others! Another thumbs-up recommendation! 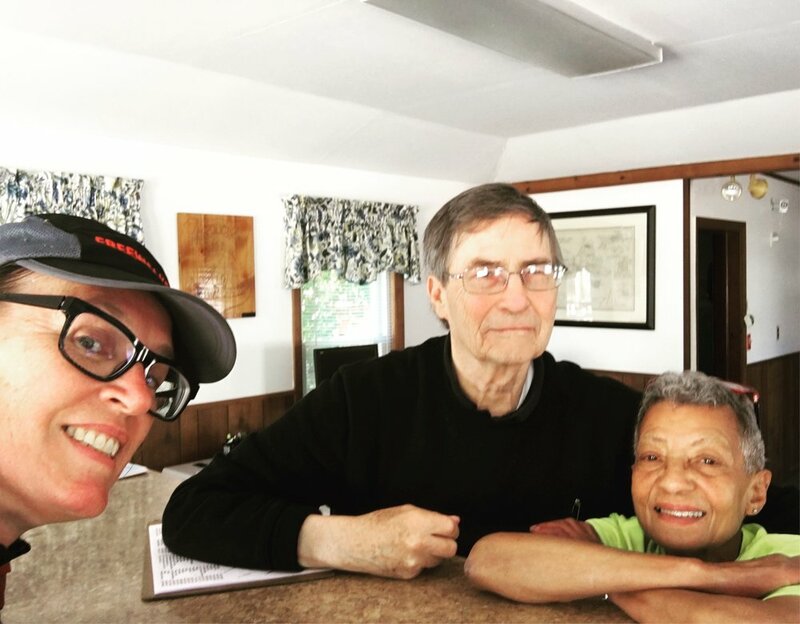 The next morning I was very lucky to meet up with my Uncle Bob and Aunt Carolyn from New Jersey. My cousin Helene and her daughter Jessica had flown from Colorado to walk with me, too! As the three of us headed towards Belfast, we happened upon Good Karma Farm, run by Jim and Amy Grant. 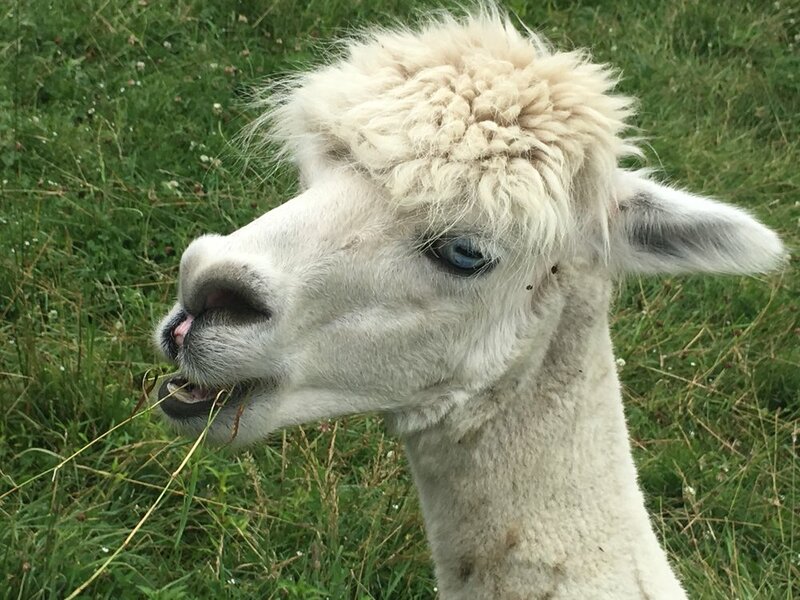 Jim gave us a tour, and introduced us to his alpacas and Icelandic sheep. He also showed us the many looms and machinery to make rugs, socks, and more. We were invited back to color our own socks later that afternoon. 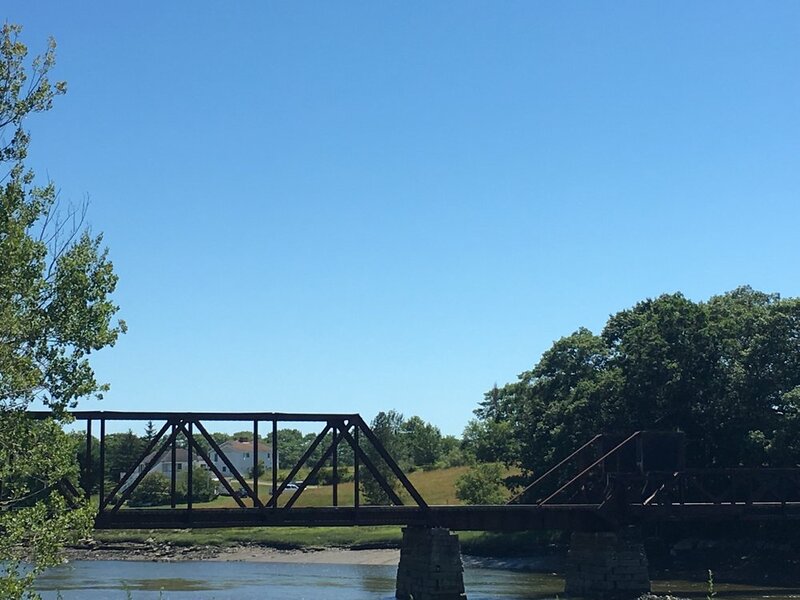 So we finished our walk into town, had lunch at a place by the water, and grabbed Aunt Carolyn for the greenway walk over the pedestrian bridge heading north before returning to the farm. Dinner in town, and we called it a day on another adventure! Sis-in-law Mary made another appearance on this journey. She picked me up in Belfast on a gloomy day for a walk to Stockton Springs. We cut the walk short due to rain, but as we got back to the car parked at Just Barb's, the sun was attempting to shine through. 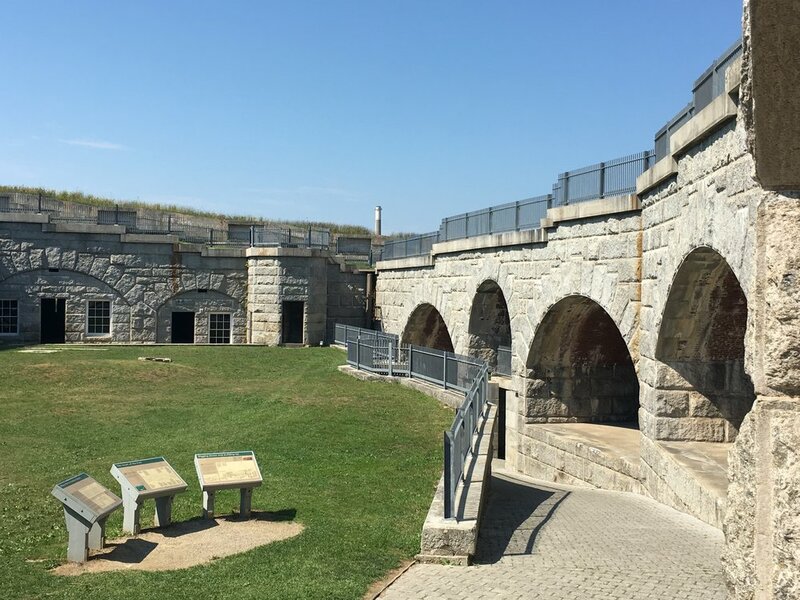 We took our chances, and headed to Fort Point State Park, a "military, maritime and tourist center" that overlooks both the Penobscot Bay and River. 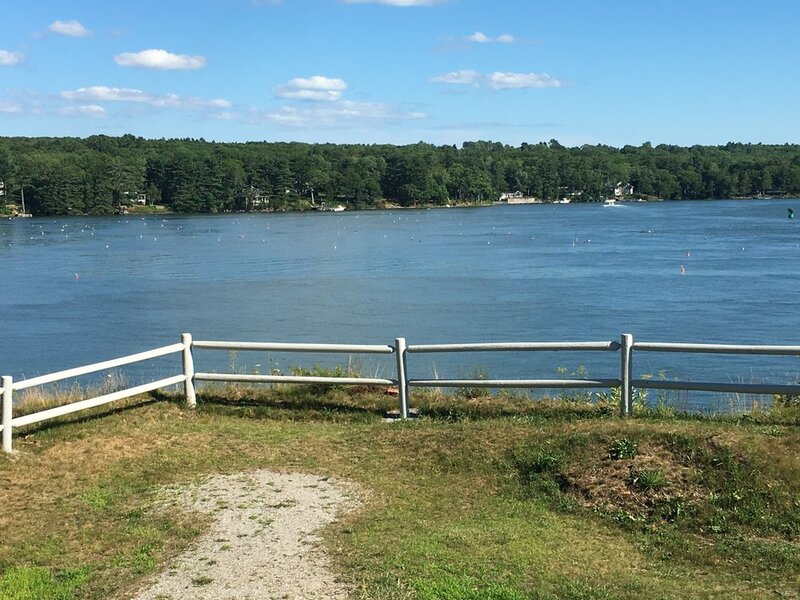 There are a number of trails and picnic tables, and a long dock to watch over the water. There is also a lighthouse with a private residence at the base. Mary and I spent the night at The Homeport Inn in Searsport. 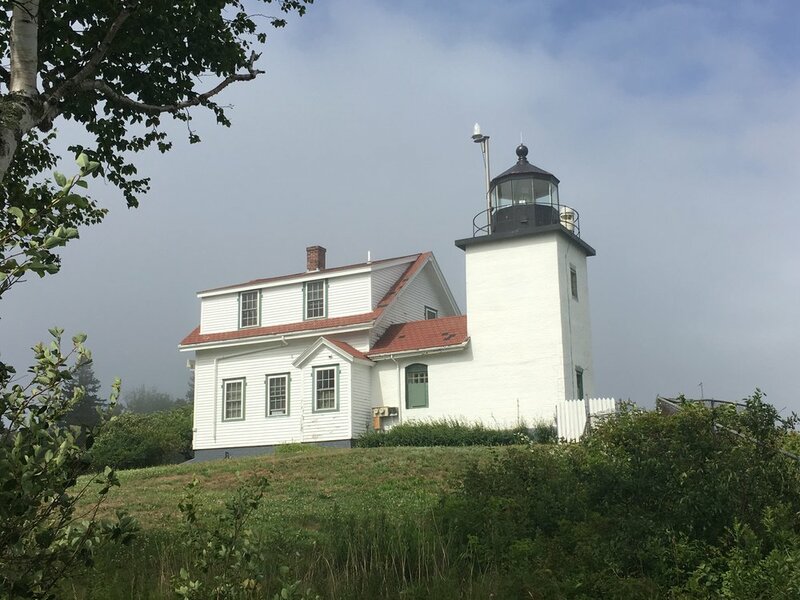 The inn was built in 1861 by Captain John P. Nichols, a prominent sea captain, and is on the National Register of Historic Places. We were welcomed by Anita, and she had us fill out our breakfast requests for the next morning. Do not be fooled! Even just one pancake is huge; delicious, with real maple syrup, but seriously can be shared. 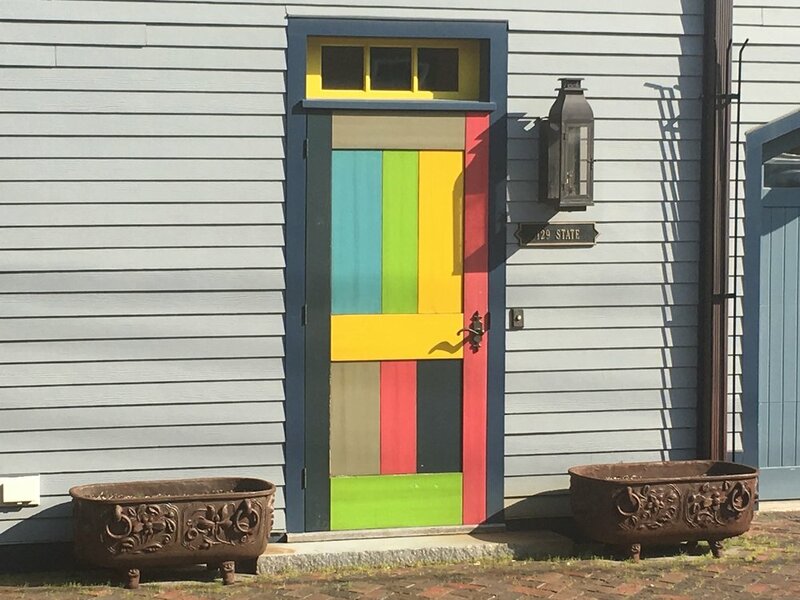 If you happen to be in Searsport, consider this inn! Our bellies full the next morning with made-to-order eggs and more, Anita was kind enough to ferry us up to Fort Knox near Bucksport to drop off our car, and then drop us back at Just Barb's to start our walking day. 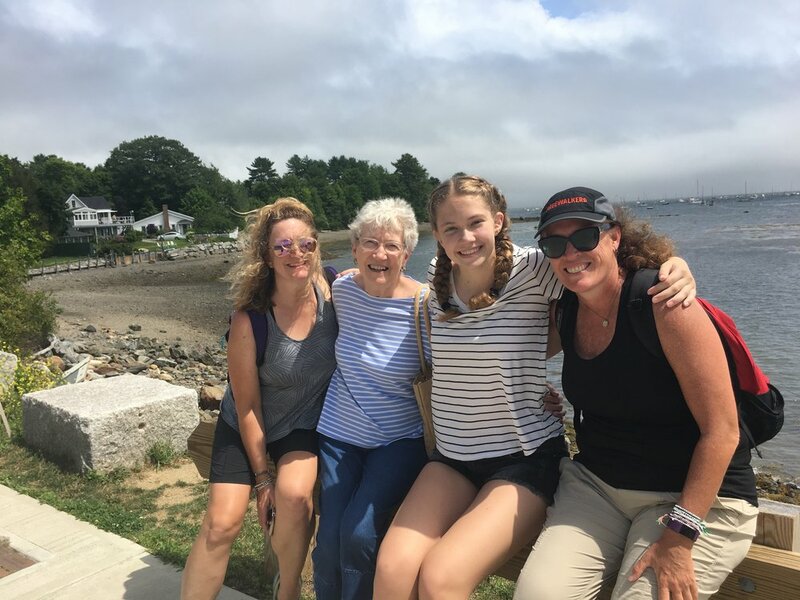 Mary and I found a few side streets that allowed us to cut off parts of Route 1, and at the start of one of these shortcuts, I was stopped short by the site of Schoodic Mountain in the background. I've hiked that mountain more than once with Michael, and it made me catch my breath at seeing how close I was to finishing my journey. was up at the top of this! We also took the elevator up in the Penobscot Narrows Observatory. You could see Cadillac Mountain in the distance, and you could look down at the cars crossing the bridge. The floor to ceiling windows on the three floors you can visit might be a bit much for anyone afraid of heights. 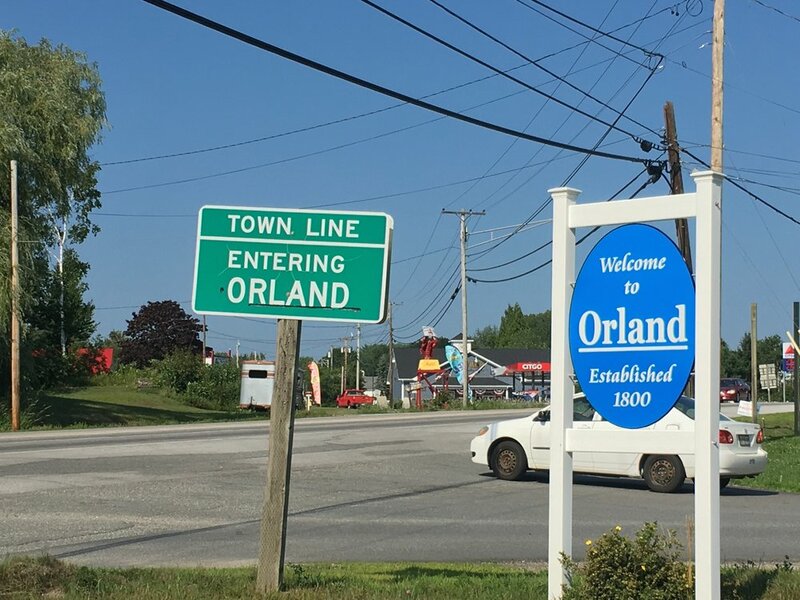 I snapped a photo of the 'Welcome to Orland' sign, and we were off to see the Maine Poppers in Bangor. Chris and Bonnie made steak tips for dinner, and there may have been seconds for this girl! 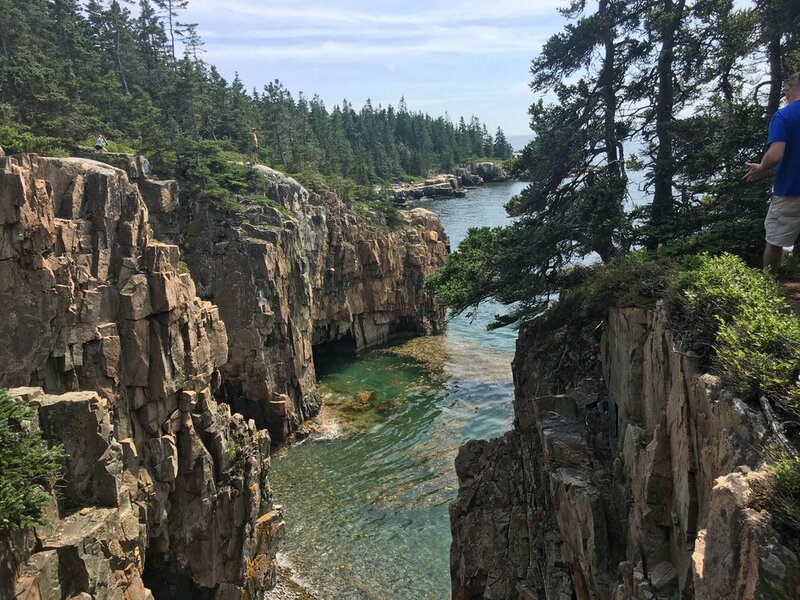 My last rest day of my journey was spent hiking on Schoodic Peninsula. Mary and I got our park pass, and made a pit stop at Schoodic Point. 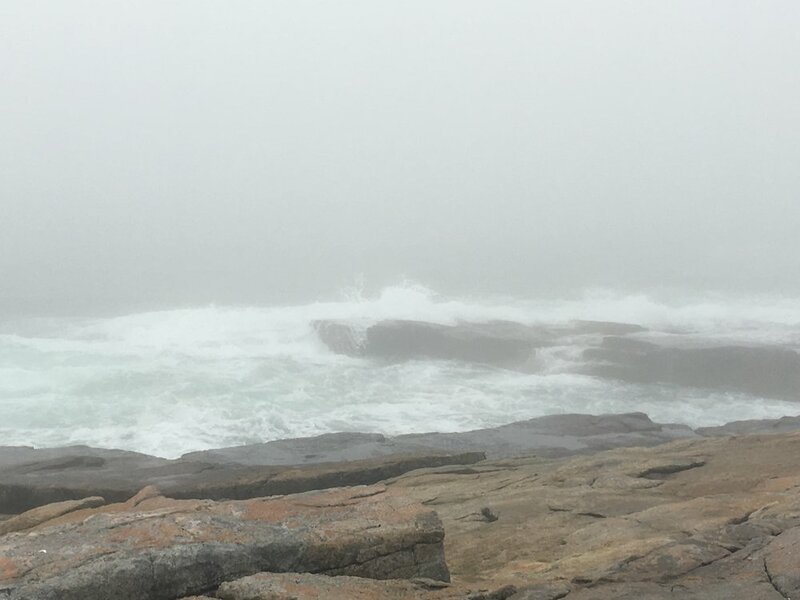 It was foggy, but you could see the waves crashing on the rocks. We saw a couple sit down to have lunch, and a seagull was directly behind them. It reminded me of the time one of the dirty birds snatched a sandwich right out of Michael's hand without even touching him. Mary warned this couple, but not long after, the woman yelped and the seagull was feasting. Before I could stop myself, I said, "Told ya." We moved on to Blueberry Hill where we parked the car. 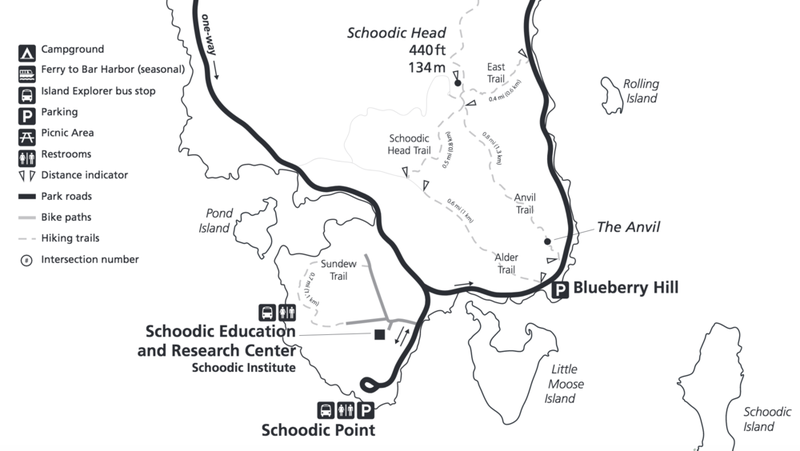 Backpacks on, we ascended the Anvil Trail, and came down the Schoodic Head Trail, and walked the Alder Trail back to the parking lot. We sat on the rocks overlooking the ocean, and were treated to a seal that was fishing. We could see him flip the fish into his mouth before he dove again. 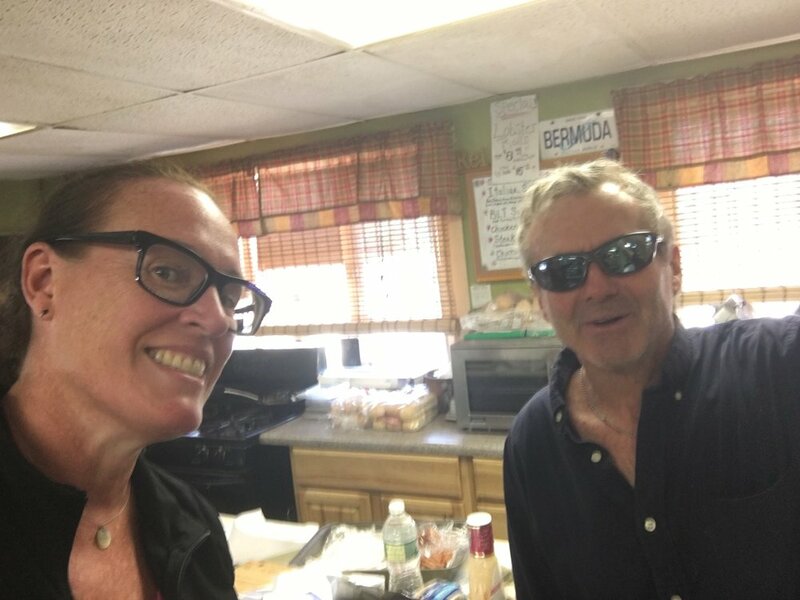 Mary and I stopped for a bite to eat at The Pickled Wrinkle in Birch Harbor, where I ran into a couple I'd met on a previous visit. From there, we headed to Littlefield Gallery to see owners Jane and Kelly. 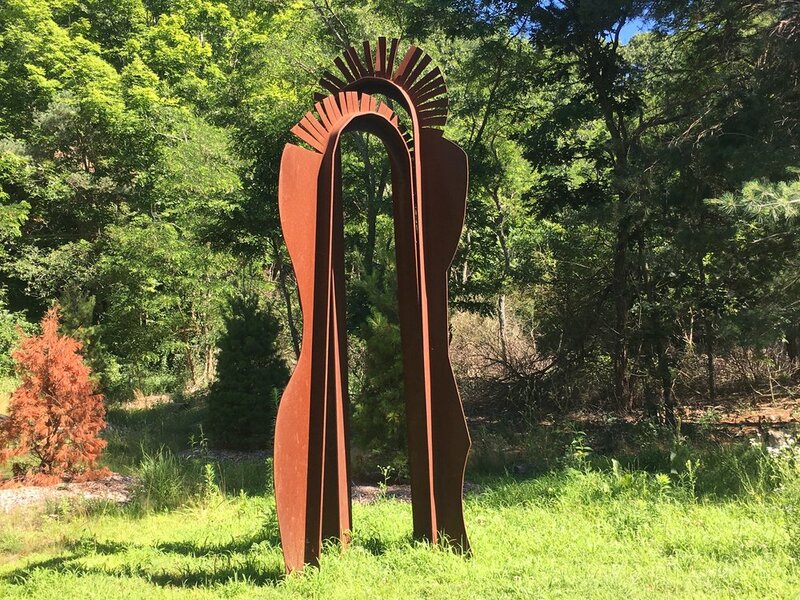 They were throwing a reception for two artists, painter Lori Tremblay and sculptor Hugh Lassen. Kelly saw me first, and said, jokingly, "Could you pick up the pace?" I said I've been doing the best I can, and we embraced. And then Jane spotted me. I'm surprised she didn't drop the tray with cheese and crackers on it. She handed it to someone, and grabbed me and squeezed. I adore this woman who is always so happy to see me, as I am her. Mary and I couldn't stay long because we were meeting Chris and Bonnie at Blaze in Bangor. 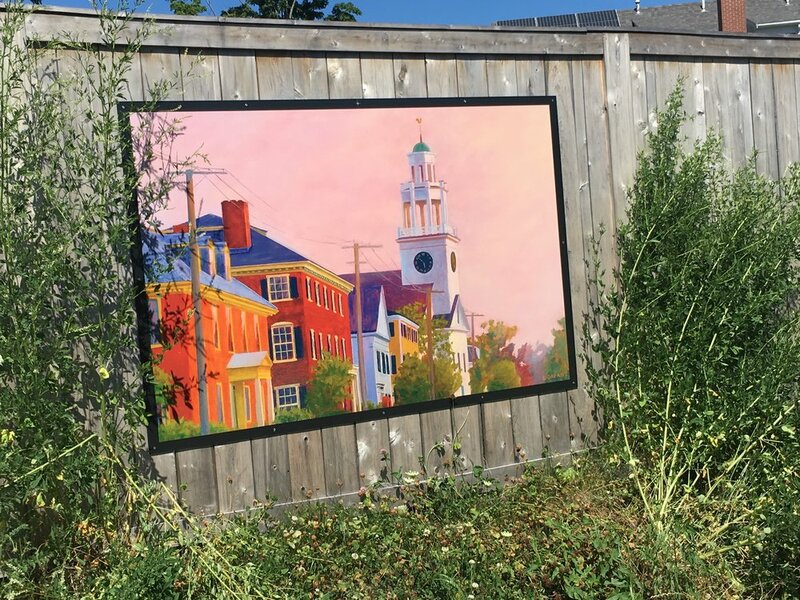 But before I left, I met artist Caren-Marie Sargent Michel when I remarked on her "Seawall Beach, Acadia #14." She is lovely, and her work is inspiring! Another gentleman was standing nearby. 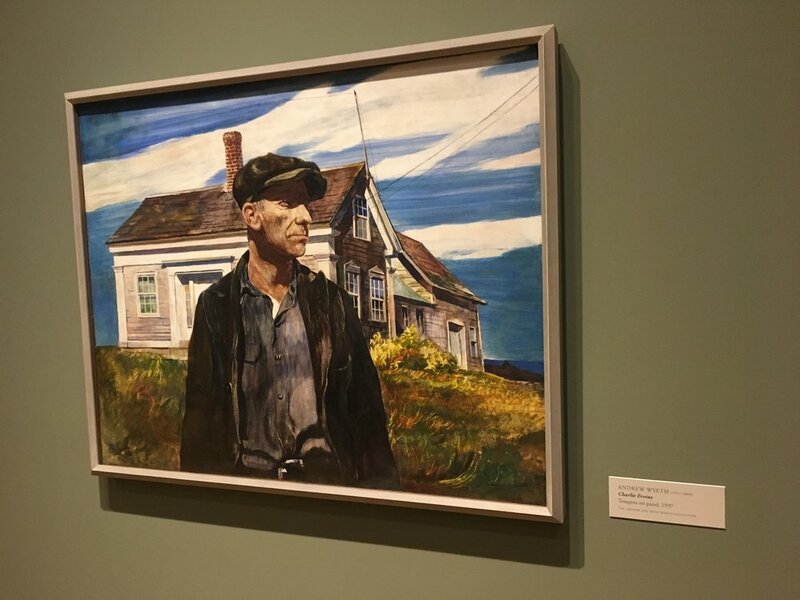 It was Don Crowley, a cousin of Bruce Crowley, the lobsterman who helped save my life. After conversation and then a pause, I asked Don to give Bruce my regards, and to tell him I'm doing as well as I can since the accident. Then on to Bangor for dinner! Today I walked eleven miles from Orland to Ellsworth, again on Route 1, with little shade to be had. 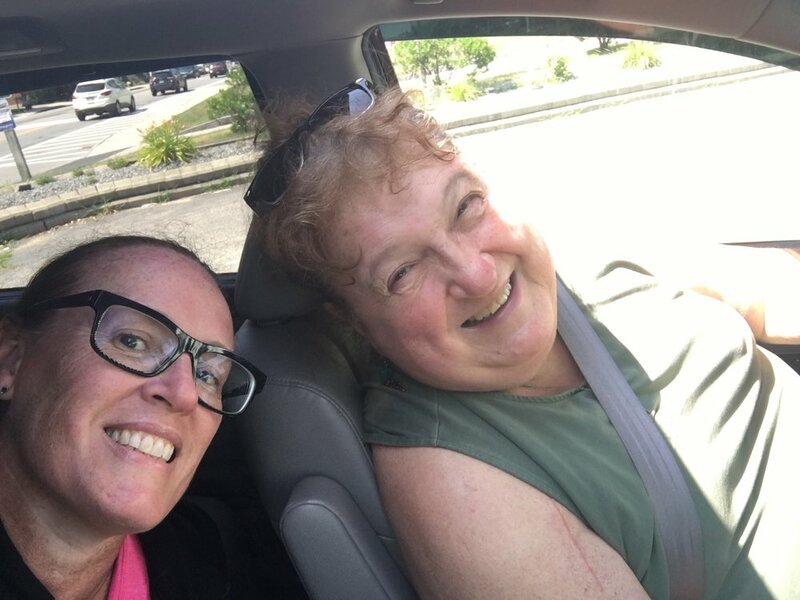 My own personal sag wagon, driven by Chris, met me in the downtown area, and we headed back to meet up with Bonnie for a church picnic. It's hard to explain the feelings that overcome me with each passing day on this journey, especially as the days dwindle. But I'll continue, and I look forward to seeing friends and family as I close out this endeavor. 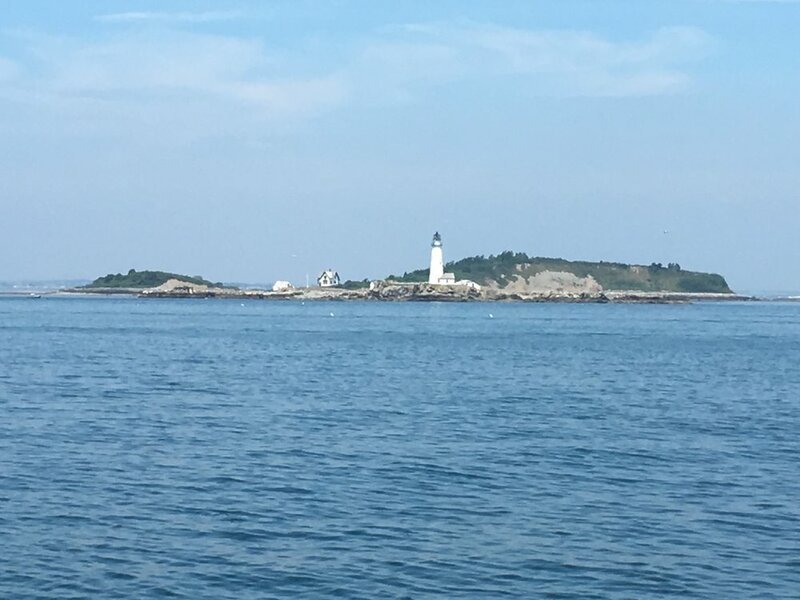 My trip from Kennebunk to Biddeford was along the Eastern Trail, 22 off-road miles leading all the way to Bug Light in South Portland. I finished in Biddeford, and while I waited for Michelle to pick me up, I stopped in at Round Turn Distilling. Not only did I get to meet Darren, a friend of my friend, but I got to sample some Bimini gin. Oh my! Speaking of feelings, I was a little nervous meeting up with Dan the next day, along with his sister Kelly and husband Jim in Biddeford. Dan and I had planned to walk to Scarborough that day. 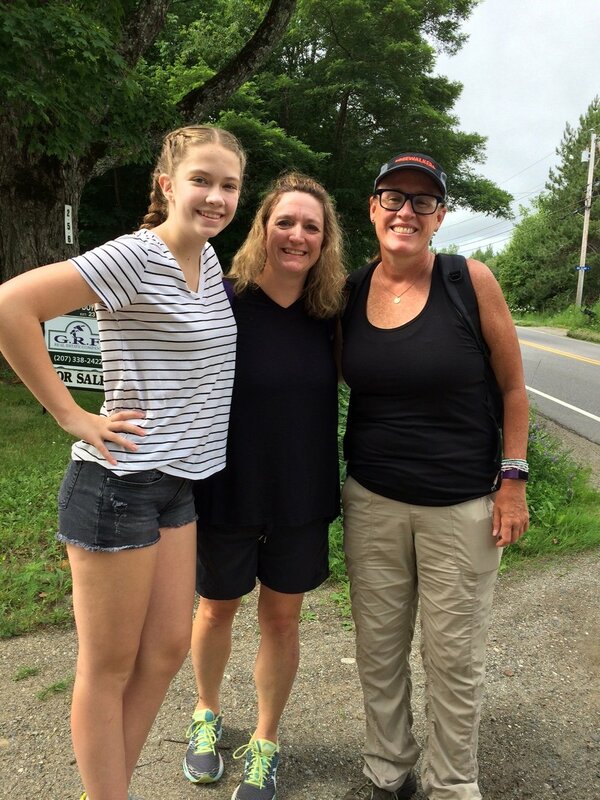 Michelle, her husband Pat and I were late leaving Moody Beach, but when we pulled up in a parking lot before the Saco bridge, we were greeted with folks decked out in Jenn's Journey North t-shirts. All good! 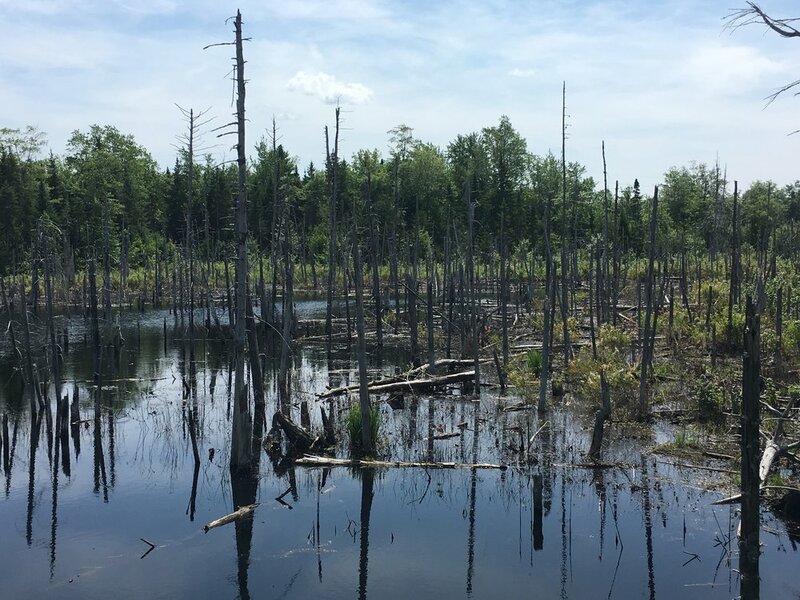 Dan and I set out for our trip along the Eastern Trail, and it was amazing to walk through marshes on both sides. People were kayaking and stand up paddling, despite the chill off the water. We continued past our end point, heading to Kelly and Jim's house. After braving a small shoulder on a busy street, we turned left, and not long after, there they were to greet us and show us a shortcut back to their beautiful home. Dan left the next day to head back to Pennsylvania. I, on the other hand, cheated a little. Instead of walking to Portland, I rode Kelly's bike from Scarborough to South Freeport, officially checking off more than one goal! 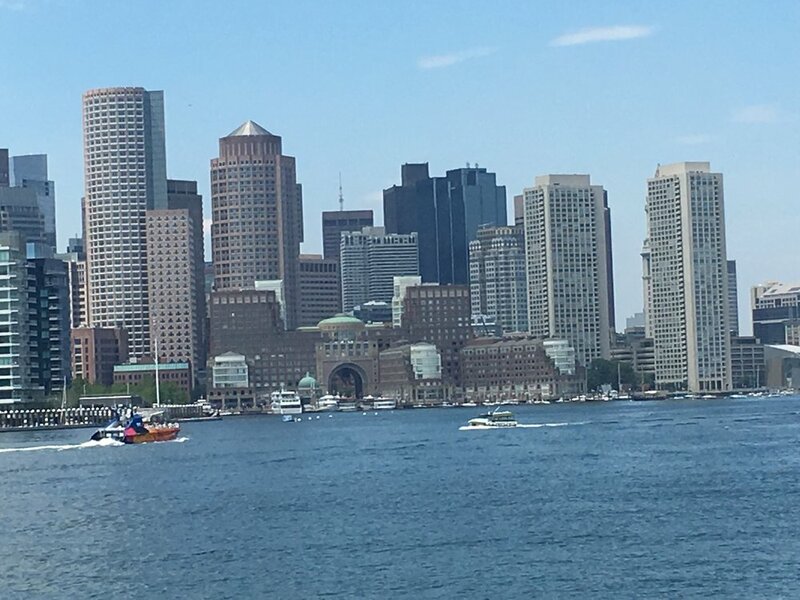 I got to ride through one of my most favorite cities, one that Michael and I would always make a point of visiting on our way to or from Winter Harbor. Portland, you'll always hold a special place in my heart. Kelly and Jim were kind enough to host me for yet another night, and I got to enjoy a day on my own. They dropped me off in the city, and my first stop was at the Life is Good store. It's become a bit of a tradition to pop in there and buy myself something. The store wasn't too busy, and I struck up a conversation with Kathi; she knows someone in the Winter Harbor area and knew of my story. 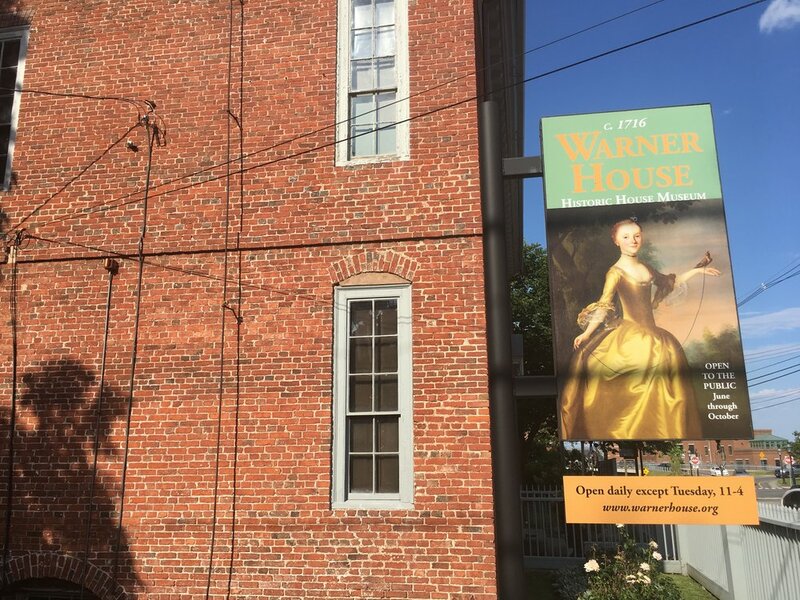 I walked over to the Portland Observatory, the historic maritime signal tower on Congress Street that was built in 1807, for a history lesson. 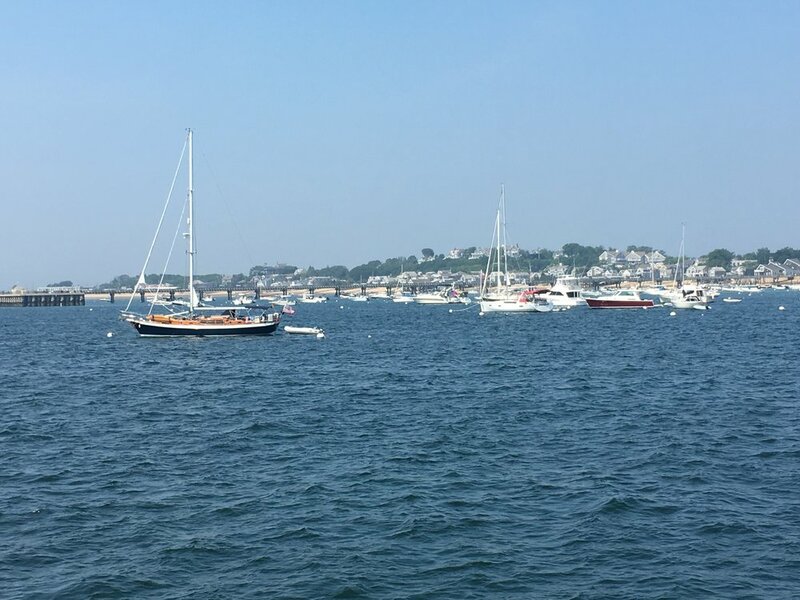 And then I grabbed a loaf of fresh bread for dinner from the Standard Baking Company behind the famous Fore Street restaurant, and took time for lunch at the Portland Harbor Hotel. I was supposed to stay there - we always stayed there - but I had taken Kelly and Jim up on their offer to stay with them again even though Dan wouldn't be there. Rest day complete, and the next day Jim dropped me off back in South Freeport to continue on towards Brunswick, near Bowdoin College. I waited out some rain at my Airbnb before I headed to dinner. There, I struck up a conversation with John and his friends, asking what the road was like on the way to Bath. Their response? "Busy." To be honest, I'd seen worse. 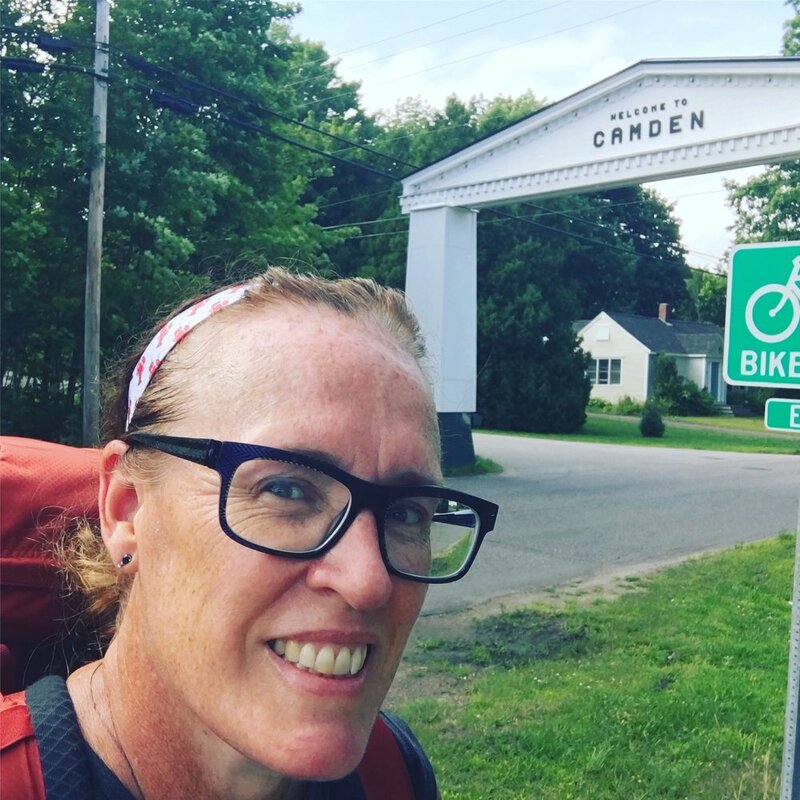 The next day Patti, my Airbnb host, dropped me off at the trail head for the greenway running parallel to the Androscoggin River. It was a pretty walk, with lots of greenery and benches to rest as you look out to the water. But then it changes, and you're walking, protected, between the river and a highway, with no shade in sight. The remainder of the walk to Bath was along a road with no sidewalks, yet again, and it was tiring, trying to pay attention to oncoming traffic while carrying Lucy, my big pack. My day concluded at the waterfront park overlooking the water and the Sagadahoc Bridge in Bath. Lodging was in North Edgecomb, so after a quick lunch, I grabbed an Uber to my Airbnb, The Echo 1838, that was, literally, across the street from a real, live fort! On the way through Wiscasset, we passed the infamous Red's Eats, with an incredibly long line. I didn't go to dinner there because of that. But I did enjoy a lovely walk over the bridge back towards the fort. The water was still, and reflected everything. 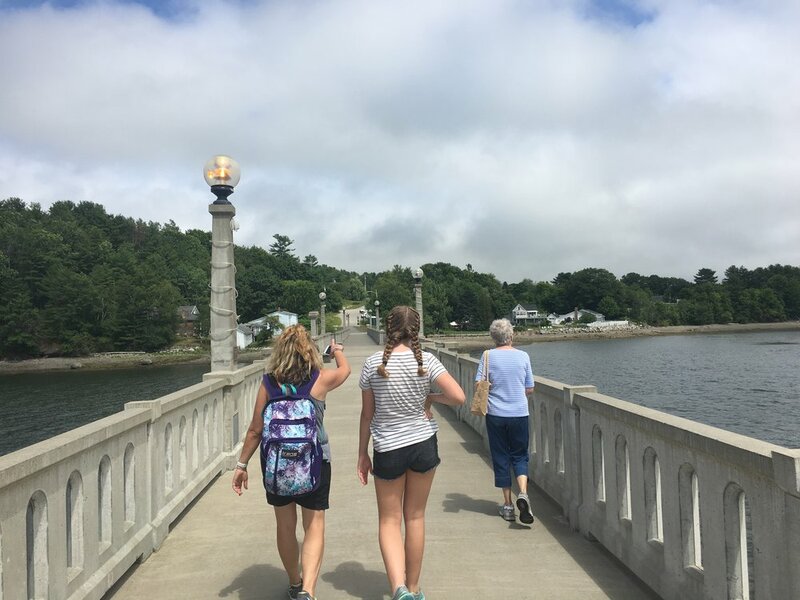 The walk from North Edgecomb to Damariscotta was uneventful, unless you count having to pay attention to 55 mile-per-hour traffic whizzing by on Route 1. That is, until I had to bear right in Newcastle! A car pulled over, and a gentleman got out and introduced himself as Dan. It didn't dawn on me that it was Dan, my host that night! 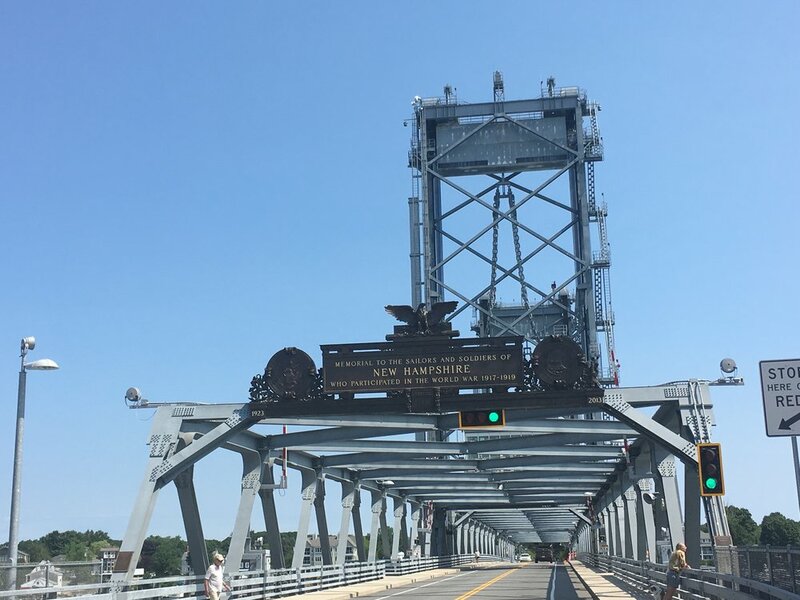 He lightened my load by taking Lucy, and I easily strolled through town, over the bridge, and checked off Damariscotta! 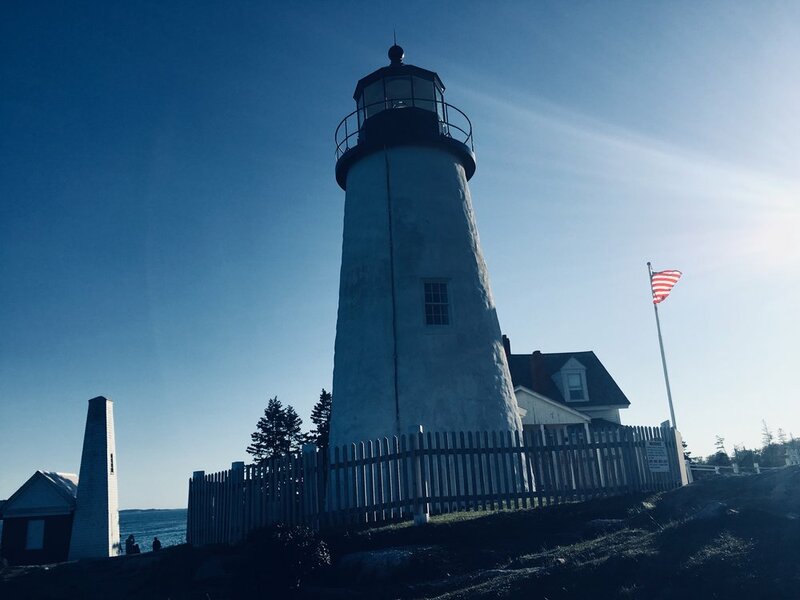 Dan and his lovely wife Claire gave me a tour of their part of the peninsula, including the Pemaquid Lighthouse. A late dinner, and I was pooped. Off to bed I went. The next morning Dan took me back to Damariscotta to meet with Don of News Center Maine. He was going to do a story on my walk, and it aired that night, too! P.S. I hate the word widow, so don't call me that. 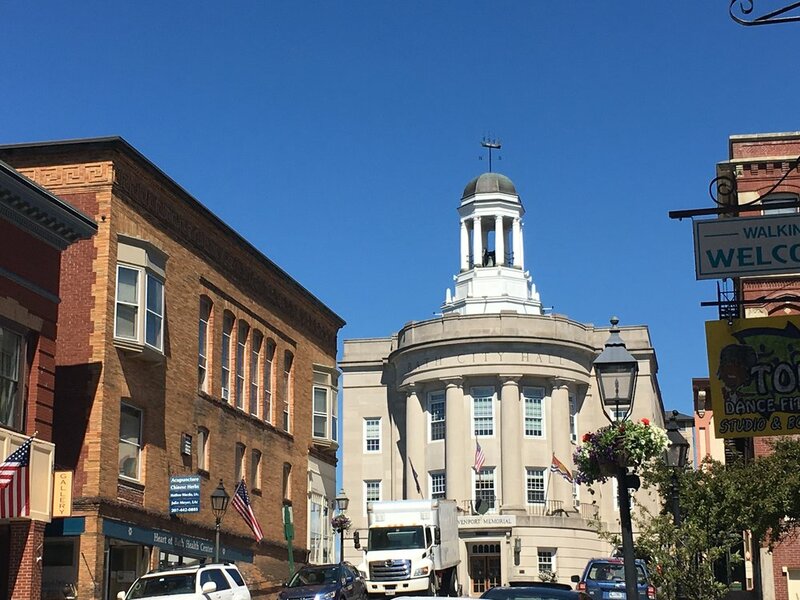 Once the interview was over, Dan dropped me off at Moody's Diner in Waldeboro, and I walked the almost twelve miles into Thomaston. I stayed two nights with Dan and Claire. 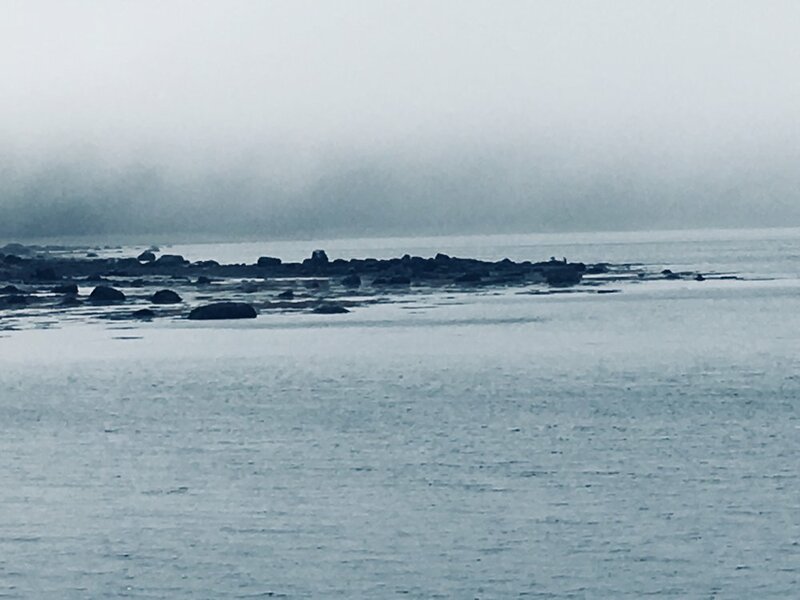 When I woke up the next morning, the fog hid everything, including the lobster boats I could hear not far off shore. But as the tide rolled in, and I watched some eider ducks, the fog lifted on another beautiful morning. 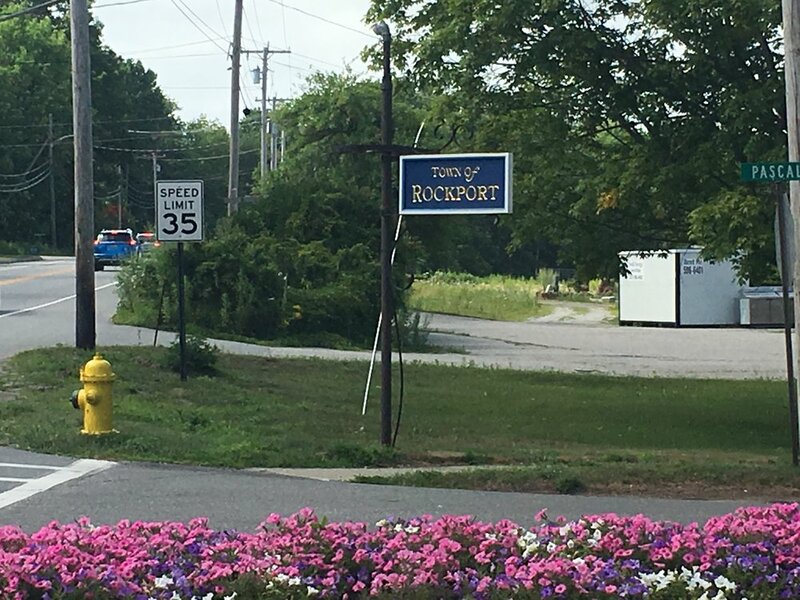 The day would include a "short walk" from Thomaston into Rockland. My hotel there was sponsored by my witty and caring big sis Liz. After dropping off my bag, I had the chance to relax, just by myself, not having to tell my story yet again. It was divine. Dinner was at a lovely Italian place called Rustica Cucina, where I met New Zealanders Bill and Kathryn. 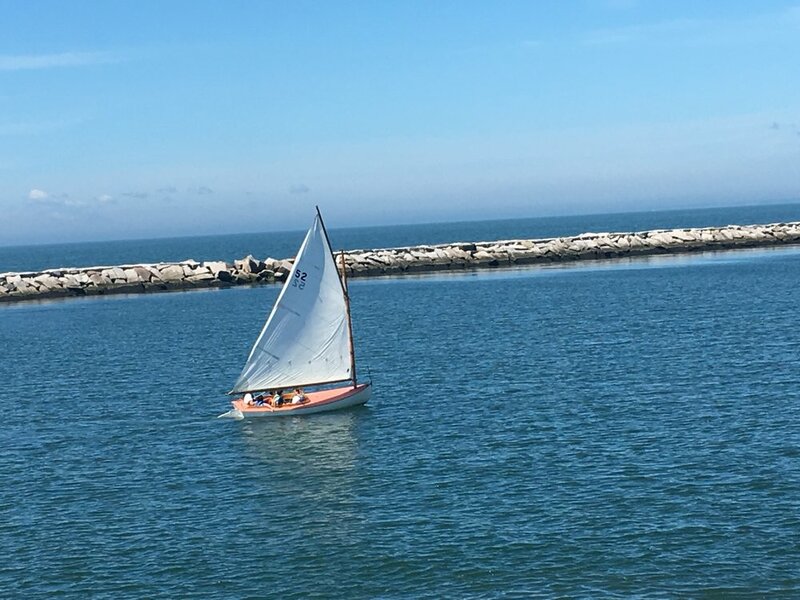 They were sailing, on their way back from the Acadia area. My Rockland rest day was spent mostly indoors because of the rain. I got sucked into watching The Open, which was taking place at Carnoustie in Scotland. Michael and I had attended this tournament at this same course in 1999, and I remember watching Payne Stewart play. He died a few months later. 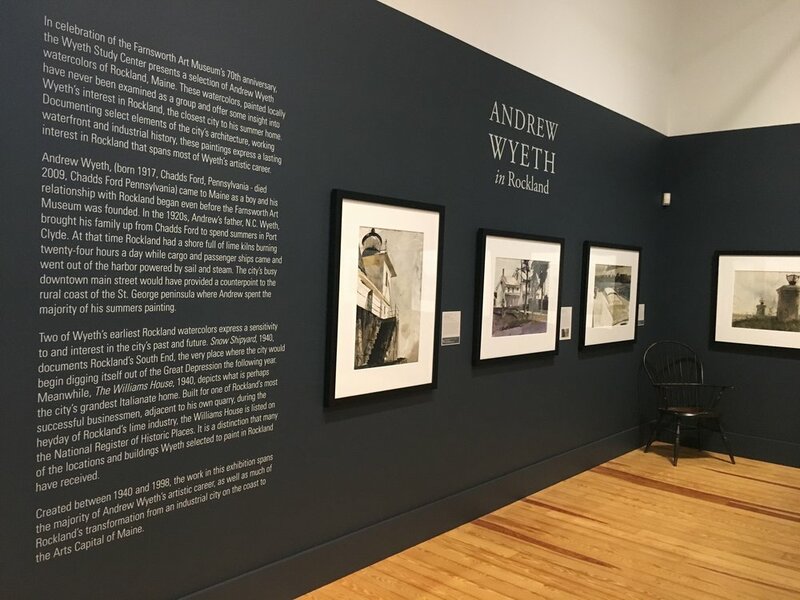 I did manage to make it to the Farnsworth Art Museum, which featured an exhibit on Andrew Wyeth. Advice for anyone visiting Rockland on a Sunday: go out to dinner early as there are only a handful of restaurants open, and they all have lonnngggg waits, even for take-out. Tomorrow I'm off to Camden. 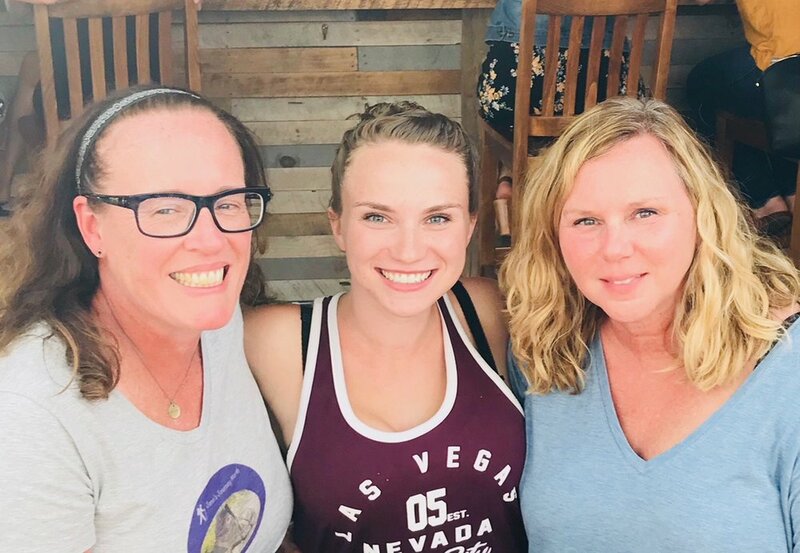 I have two more nights on my own, and then I get to hang out with my Colorado cousin and sister-in-law, too! The past two days have included a ton of walking on nothing but residential streets. While there are some beautiful homes, it is draining to not have the option to pop into a store for a drink and a quick snack. 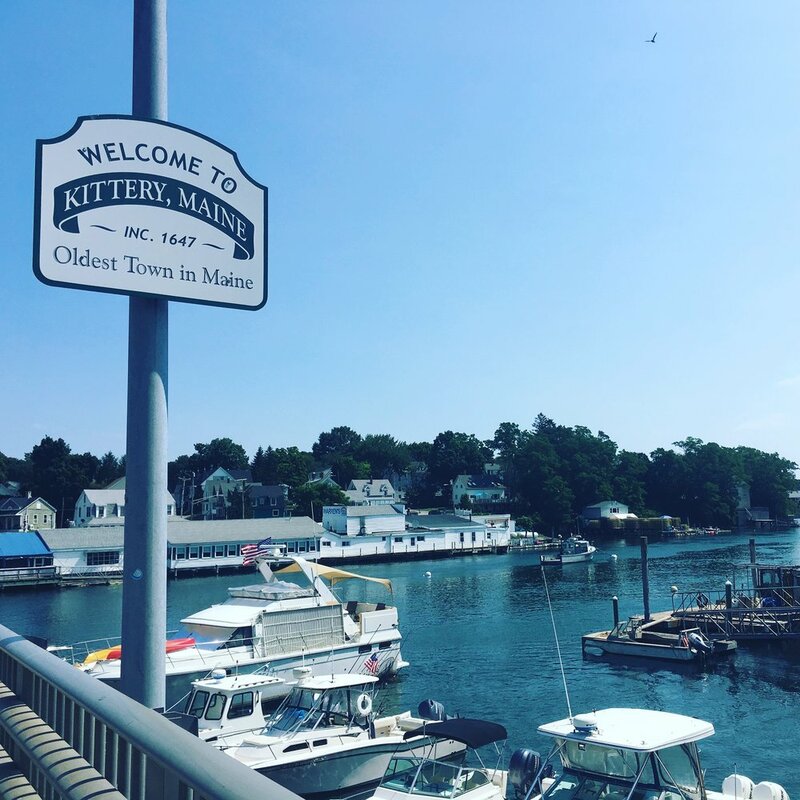 I left Portsmouth, crossing over the Memorial Bridge into Kittery. I didn't see a big 'Welcome to Maine' sign anyway, so that was a bit of a letdown. The best part of my walk was when I got to drop into Eliot Meet Market; no, that's not a spelling mistake on 'meet'. It was there I met Scott, the funny and inquisitive guy behind the counter. When he and some customers found out why I was there, Scott asked if my car broke down. It turns out Scott is writing a book. I wanted to snap a quick picture of the cover, but I didn't think that would be right. You see, he's writing it, for now, on a stack of paper plates! Scott's parting words about the market: "Where you get what you need, not necessarily what you want." After cooling down and rehydrating, I was off again towards South Berwick, where I would meet up with Michelle and Alexandra. But before I did, I had to take a quick Uber ride, and with whom did I ride? None other than Uber Grandma herself! It was quite the story I heard! 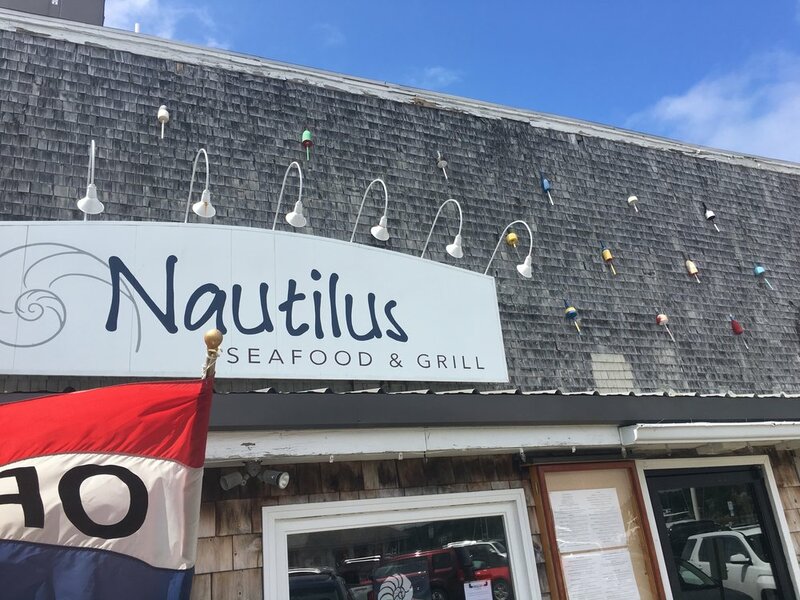 The day was topped off with happy hour margaritas at Hooks Chill & Grille in Ogunquit. 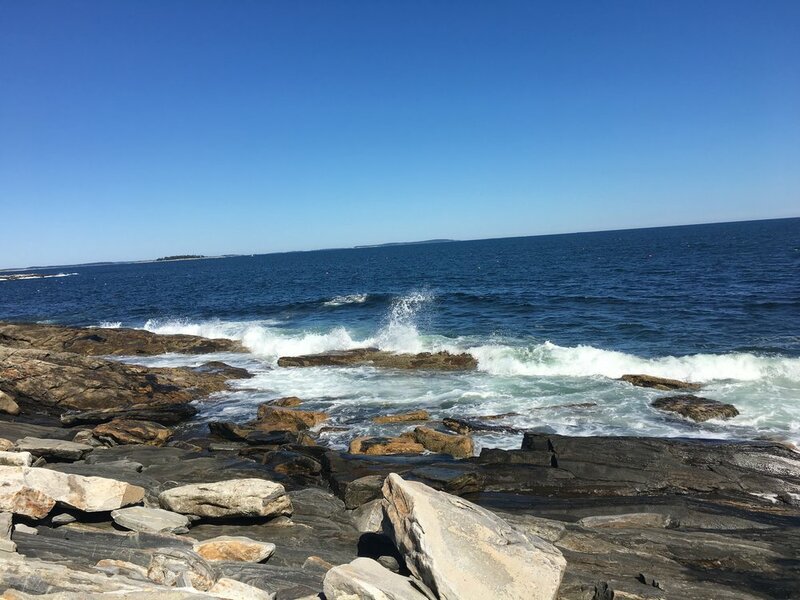 Yesterday's walk to Kennebunk did not take me towards the beach. 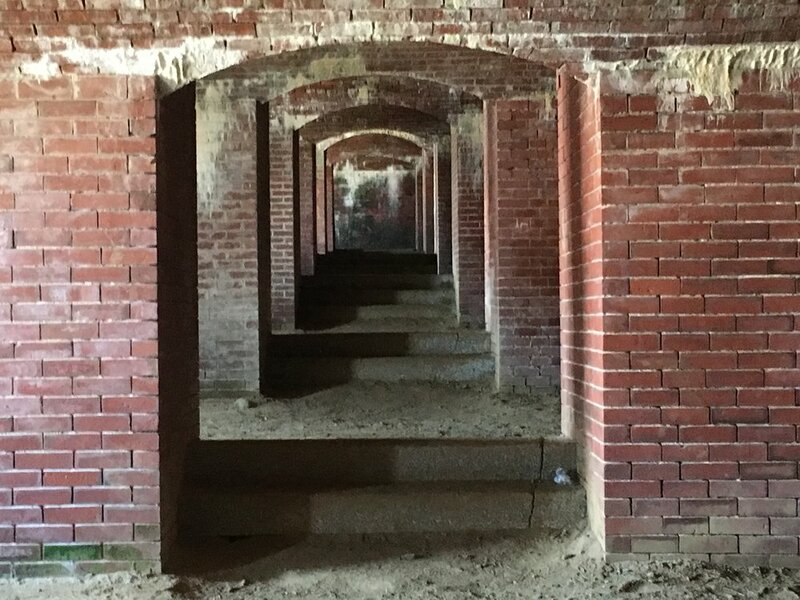 It ended in a place with nothing but a post office and a tavern that wasn't yet open. Cute area, but nothing around. I journeyed back to Wells for a relaxing night at Full Circle, sipping on cocktails on the roof deck with Michelle. Today I'll head to Biddeford, and then tomorrow I get to walk with Dan; he's traveled all the way from Pennsylvania to join me! 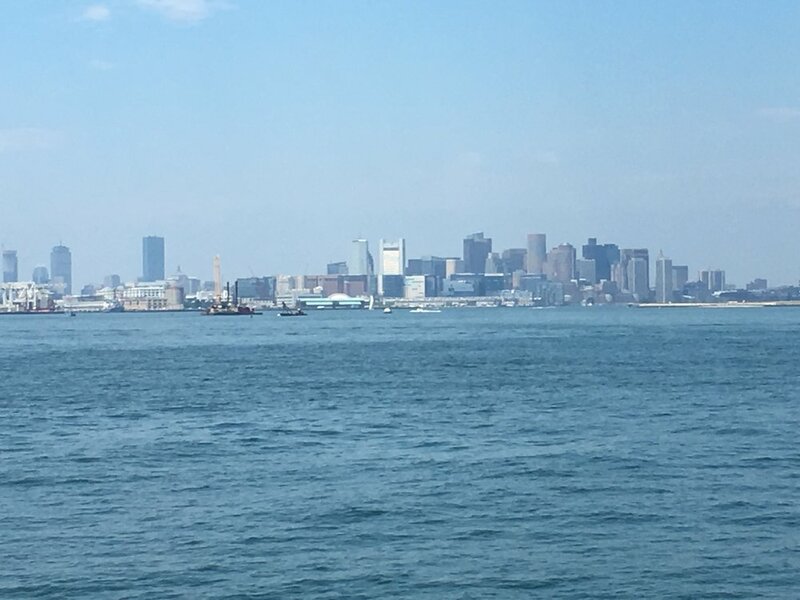 Later today I will cross the Piscataqua River from Portsmouth into the final state of my journey, into Maine. I've imagined what the moment will feel like, how much emotion there will be, much like I had when I passed from New Jersey to New York over the George Washington Bridge so many weeks ago. I've been fortunate enough to have amazing people support me along the way. 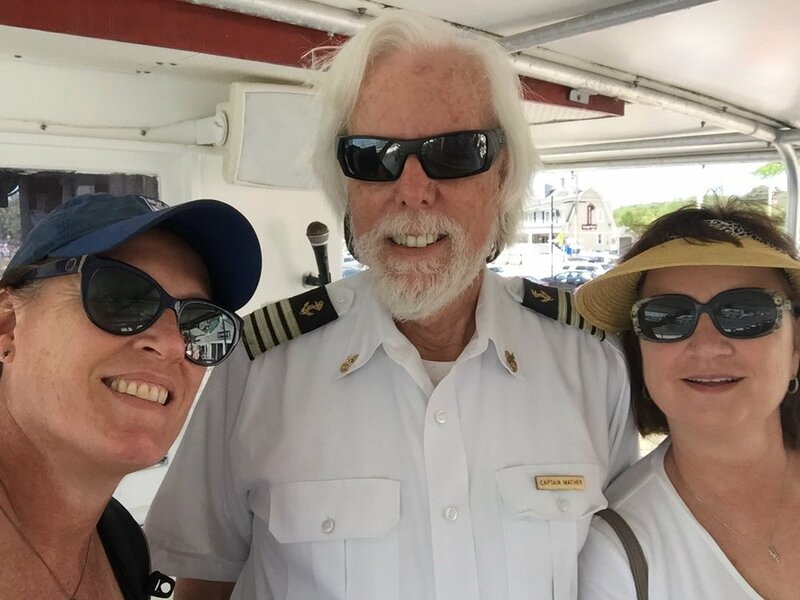 Recently, I stayed with college friend and roommate Diane, who picked me up in Marblehead. I didn't get to walk the leg of my trip to Topsfield because of torrential rain; instead, I opted to find a salon to take care of some overdue roots before Diane could pick me up. I met with Rich of Fagone & Company, and after talking about why I was in town, he threw in a free trim to give back to my cause. So in addition to a great color and cut, I suggest you check out this salon for its philanthropic ways. Diane found me, and we headed back to her home in Ipswich where I got to meet Scout, her friendly puppy. Conversation was easy with my friend despite the number of years that have passed since we last saw each other. The next day she dropped me off in Topsfield to catch the Border to Boston Trail. Traffic on this section was light, with some bikers and even fewer people walking their dogs. There was a bit of confusion on my part when I thought I could stay on this trail longer than I really could. 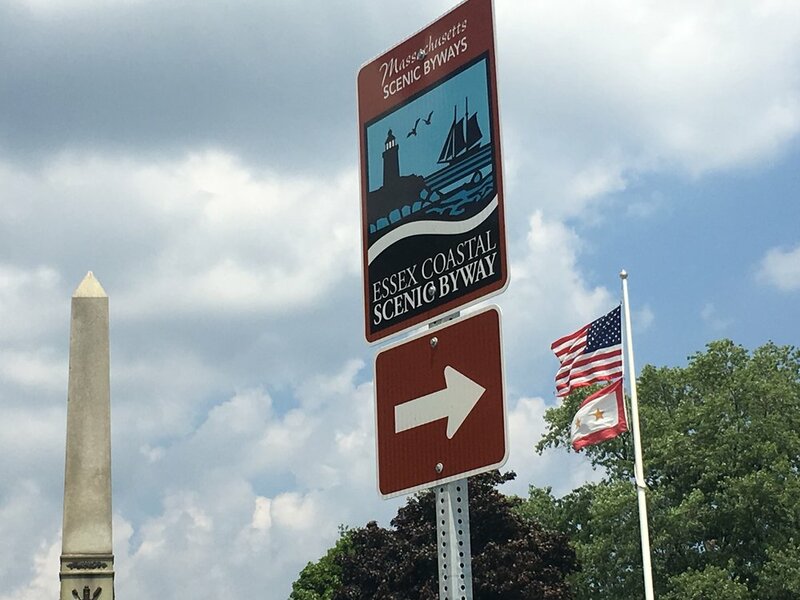 I had to backtrack a bit, and then the East Coast Greenway signage pointed one way, while the map on its website indicated I should go the other way. I figured it out, but think I ended up walking more than I needed to do. Additionally, after you leave the trail, you walk nothing but residential streets. I find this hard because there are few places to rest, escape the sun, and refuel. The Newbury to Hampton leg of my journey was much more enjoyable. 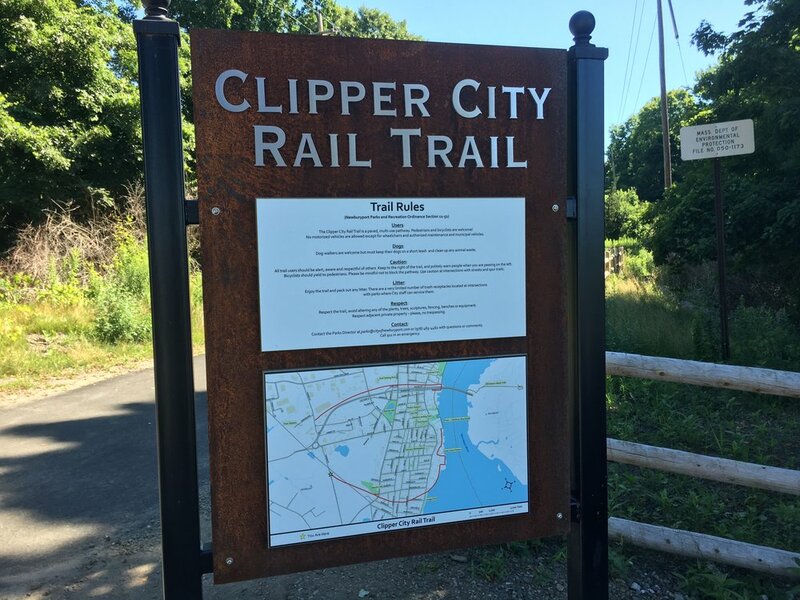 I started on the Clipper City Rail Trail to Newburyport, an adorable town on the water with lots of pedestrian walkways, and shops and restaurants abound. 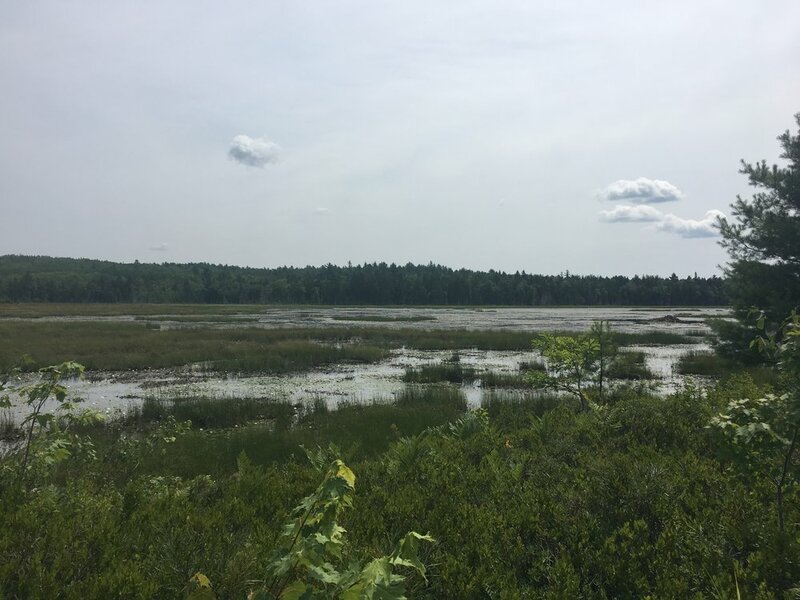 I finished the Old Eastern Marsh Trail, and took a quick water break. An older woman approached me as she waited for her friend, and we chatted. She seemed sad, and then said she has buried two brothers in the past three months. After I responded when she asked why I was there alone, she reached out for a hug. I hope she was able to enjoy her walk despite the sadness that enveloped her. My route then took me out on the road, but thankfully there were sidewalks. (I love sidewalks!) At least until I turned left, hugging the ocean as I headed towards New Hampshire. Seeing that sign at the state border left me elated and exhausted all at the same time. l finished my day traveling into Hampton, the complete opposite of Newburyport. It seemed more like Seaside Heights to me. Whaley makes it to NH! Instead of picking up in Hampton, Diane dropped me in the quaint town of Rye. 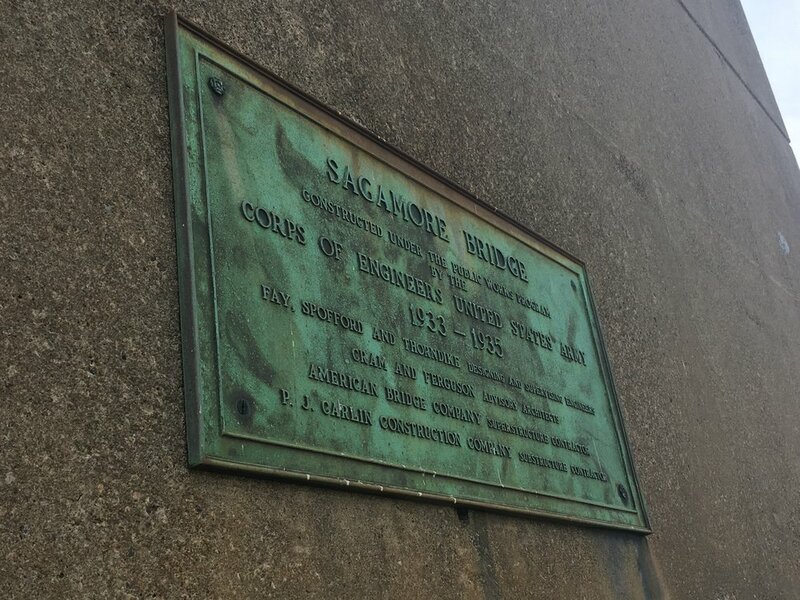 Moments after I started, I saw a sign marking the Brackett Massacre Site from 1691. Anyone in a car would miss this sign! 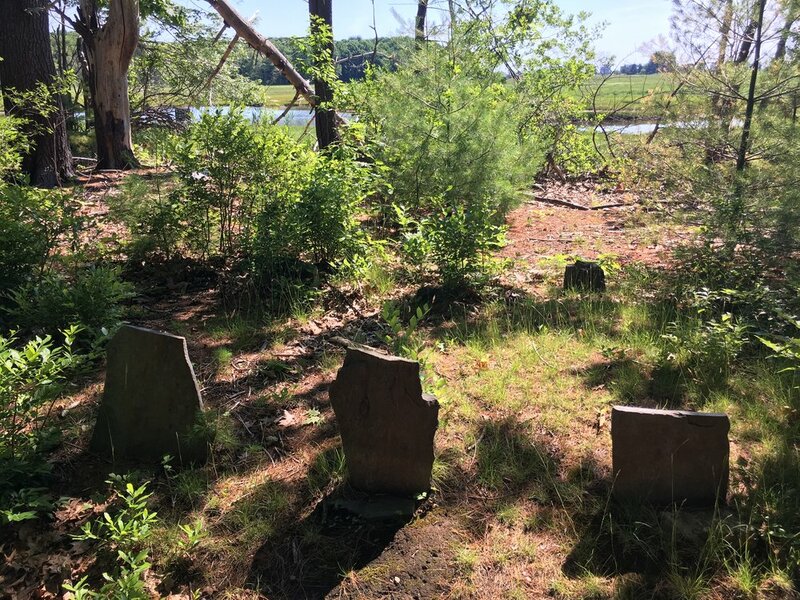 I walked in, where a marker indicated that 21 settlers were killed or taken captive by Indians. The greenway route then took me along the water. 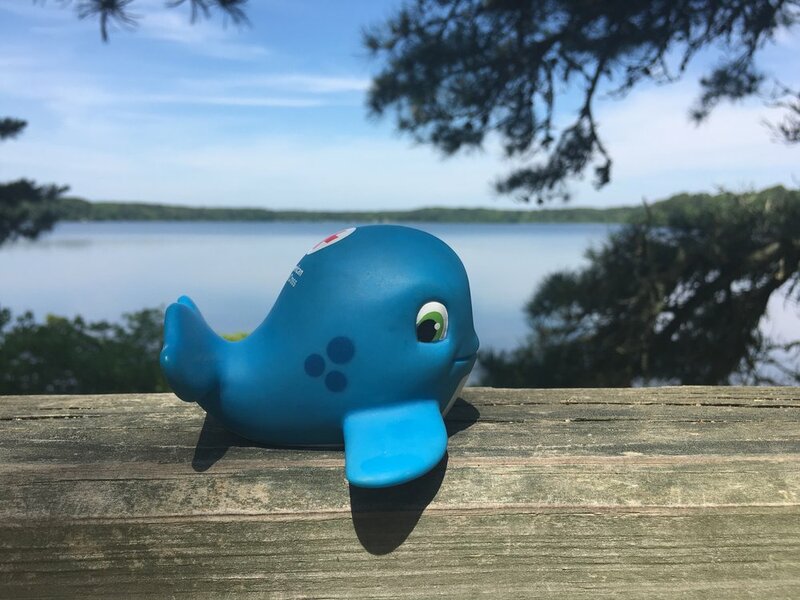 It was a beautiful day, and I couldn't resist posing a picture of Whaley, as if he'd be returning to his natural habitat. As I took a drink, a man approached me and asked about the pictures with the whale. He said he would give me five dollars if I would text the pictures to his wife. Huh? It turns out he lives nearby, happened to see me taking the pictures when he was driving, and deliberately stopped because his wife loves whales. His wife is also a hospice nurse who was about to go back to work after a brief vacation. Jim said it would make his wife's day to see the pictures. I didn't take the money, and sent the pictures. She responded: "This is awesome!!! Who is this?" Jim then added that Seal Rock is in the background. Further on, I turned into a parking area, climbed some rocks to see the water, and I was treated to a plethora of cairns. They were everywhere and it was really beautiful. 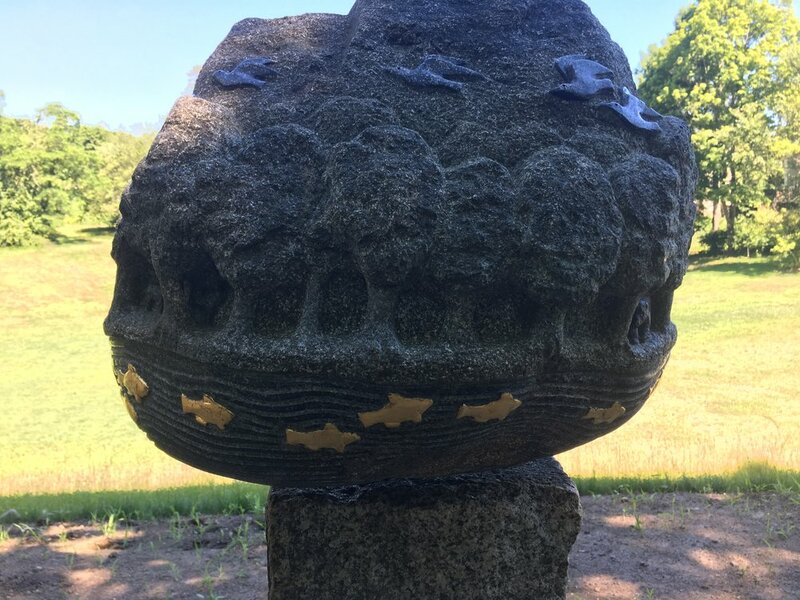 If you are ever near Odiorne's Point, you can find the cairns two parking areas south of the park entrance. I continued on, having to travel on a road with... you guessed it... no sidewalks, but soon approached a sign welcoming me to Portsmouth. Yay! But the kicker was that I still had a ways to go in the hot sun to reach the downtown part of the city. 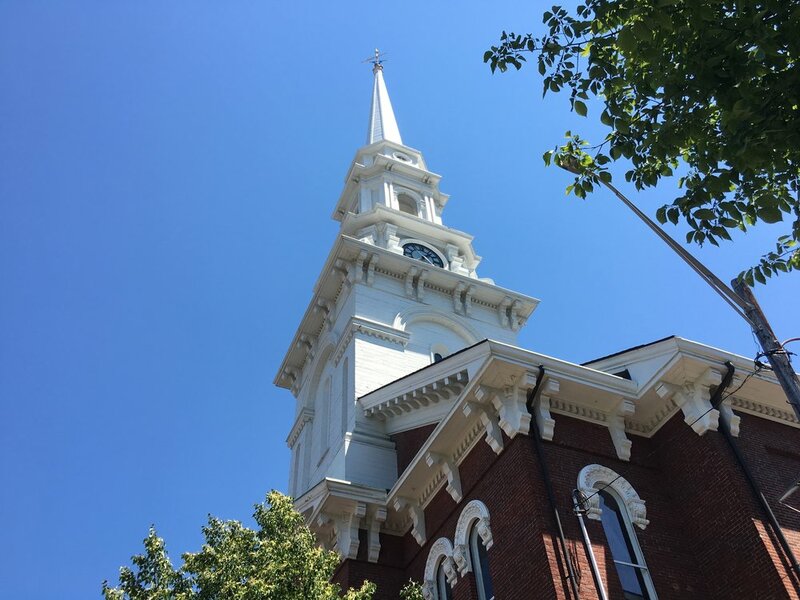 By the time I made it, seeing the North Church, I headed to the Portsmouth Brewery and treated myself to a nice, cold beer. My next adventure was to meet up with Michelle, another sorority sister from Syracuse University. She scooped me up, and we headed to lunch, where we just talked and talked and caught up on life. The day was complete as we ended up at her beautiful home in Wells. She brought me back to Portsmouth yesterday, a rest day I spent exploring the city. 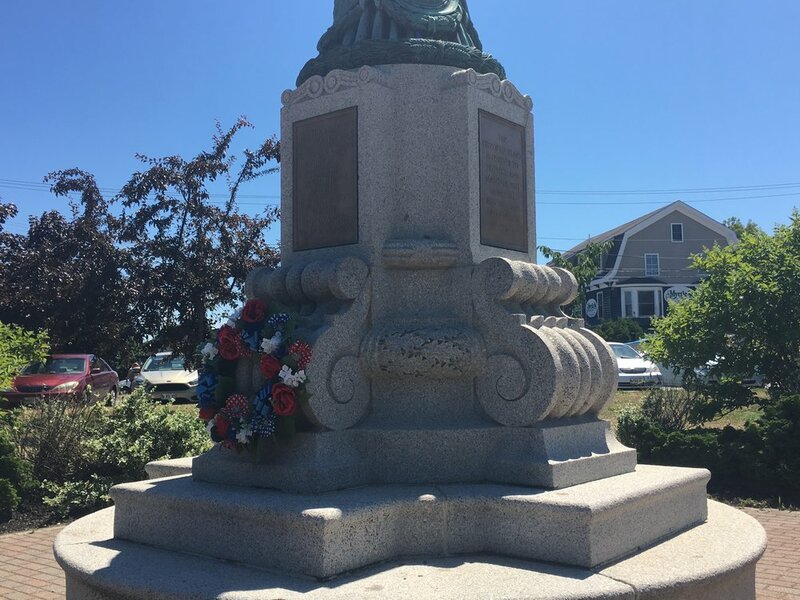 I'll meet up with her later this afternoon when I reach South Berwick, my first city in a new state. I recently seem to be alternating walking days and rest days. My first month was filled with a week of walking, and then a rest day. Even then, I'd walk up to five miles on those days off. It poured buckets on the day I was supposed to walk to Hyannis, still on Cape Cod. It was the same day Terrie was coming up from New Jersey to visit with me. So I ended up waiting for her in Bourne where I had stayed two nights with Maura and her family. 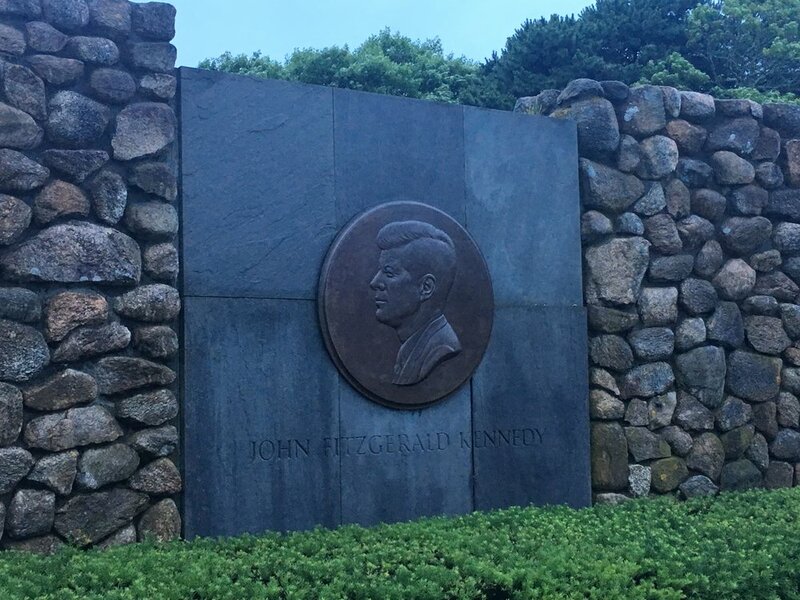 Once in Hyannis, the weather broke and we were able to explore a bit. We had dinner at Spanky's Clam Shack after getting more than one recommendation to do so. 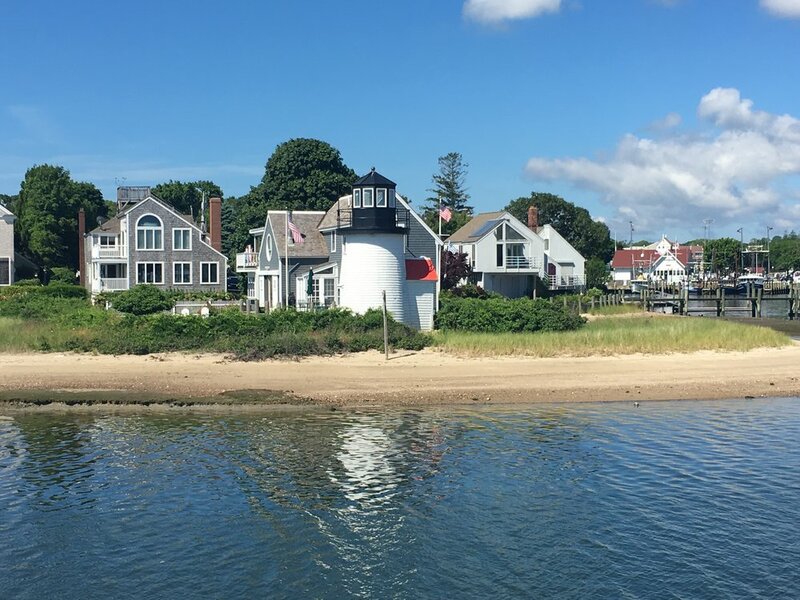 The next day, a super hot rest day, we boarded a boat for a harbor tour that gave us a peek at the Kennedy compound and more. We also managed to squeeze in about three miles that left us drenched with sweat. So we treated ourselves to some Gifford's ice cream, possibly the best ice cream brand around. Previously I've only seen it in Maine. 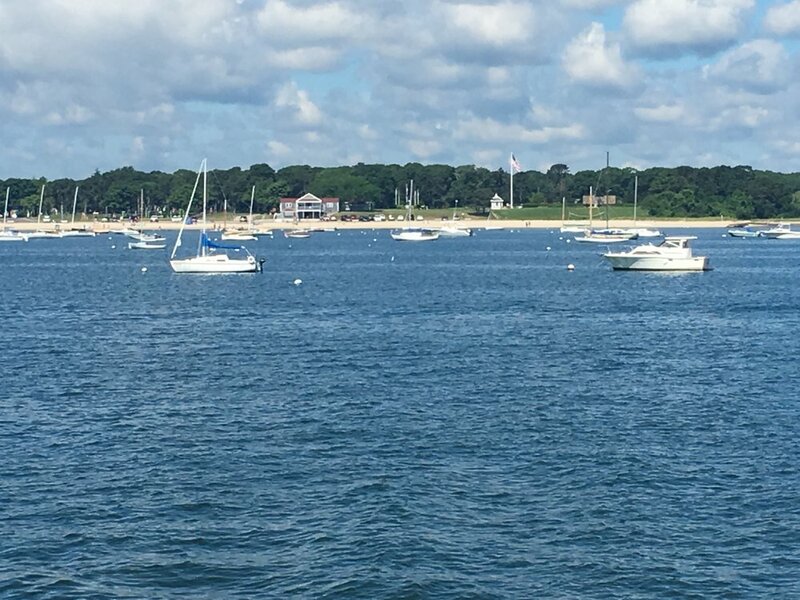 We topped the day off with dinner at The Skipper Chowder House in South Yarmouth, a popular place overlooking the water. 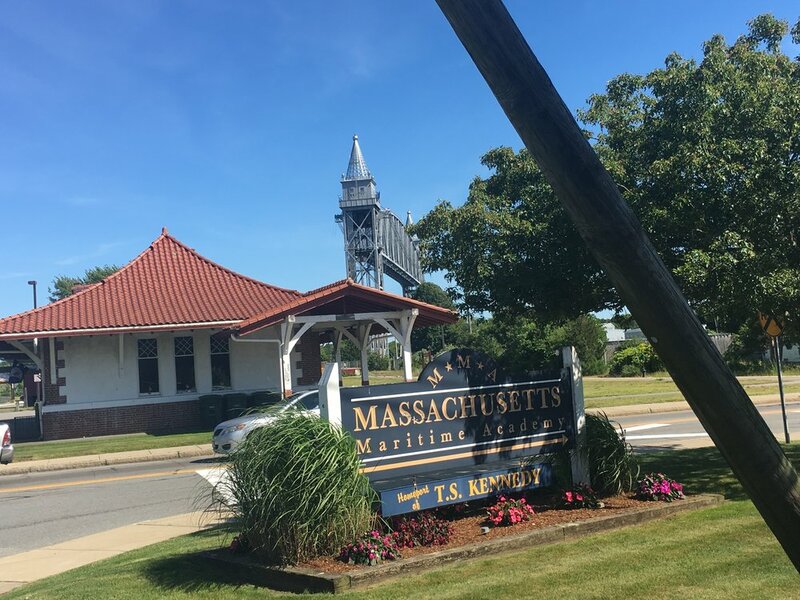 The next morning Terrie dropped me off in South Dennis, and I jumped on the bike path there to make my way to Brewster. 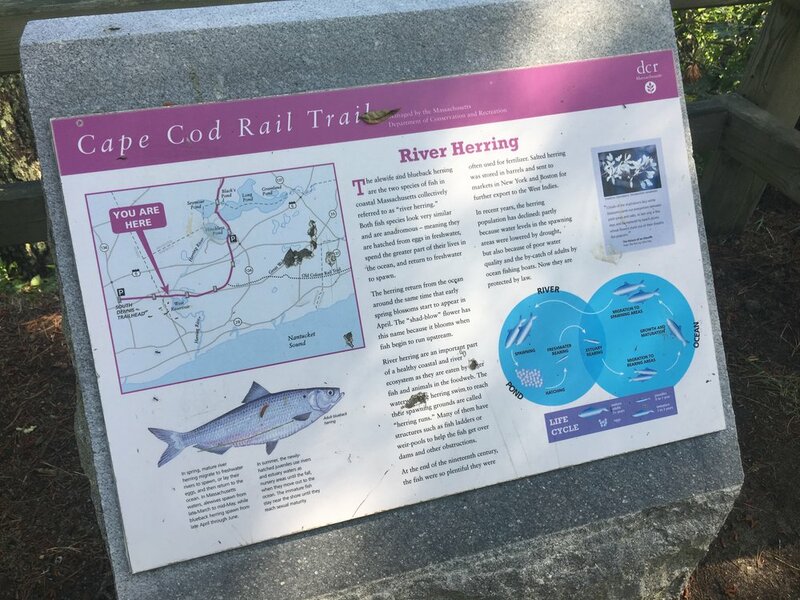 This part of the Cape Cod Rail Trail was heavily used, and weaved between lakes with both private and public beaches. I contemplated a stop to dip my feet, but the thought of having some sand stuck between my toes after putting my shoes back on to finish my day put the kibosh on that idea. The trail was relatively flat, and my stopping point included a lunch break at Stone L'Oven Pizza, right off the trail. A panini, an Allagash, and some World Cup did a girl good. After lunch, I hopped in an Uber, and headed to Jayne's. Her mother-in-law lives in the house next door, so I stayed there. I met the family, including three large and loving dogs, and we chatted on the front porch about life and people we have in common. Thanks, Bob, for pairing me up with Jayne and her crew! 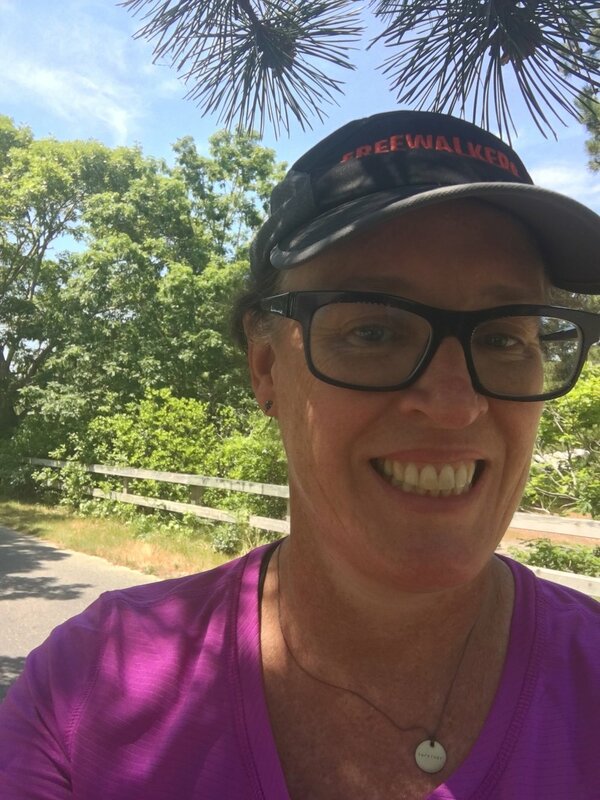 The next morning, Jayne dropped me at the bike path in Orleans for my trek to Wellfleet where I'd stay in an Airbnb. My home for the night, while comfortable, wasn't too convenient to getting around to explore. I did finally settle on a place called The Wicked Oyster for dinner. I was the only one sitting at the bar initially, and chatted with the bartenders. One of them, Gabriel, told me about some hikes around Provincetown, where I would be the next day. And he kept filling my water glass after he heard about my adventures that day and my trip overall. A wonderful scallop meal was had, and I took my car home. I've been really lucky, overall, with the drivers I've had. On this night I met Danny. As the conversation often does, he asked me what brought me to town. By the end of the trip he was trying to give me money as a donation; I couldn't accept the cash, of course. 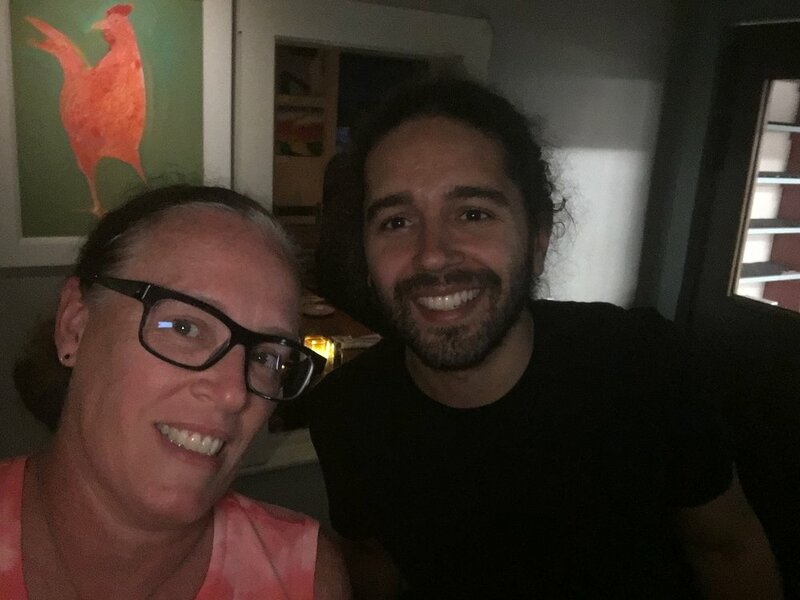 Danny found the Jenn's Journey North Facebook page the next day, and offered to help with any errands I might need to take care of before I left for Boston; he knew Ubers were scarce once the weekends pass. His kindness was most appreciated, but I was already on my way to my next destination. 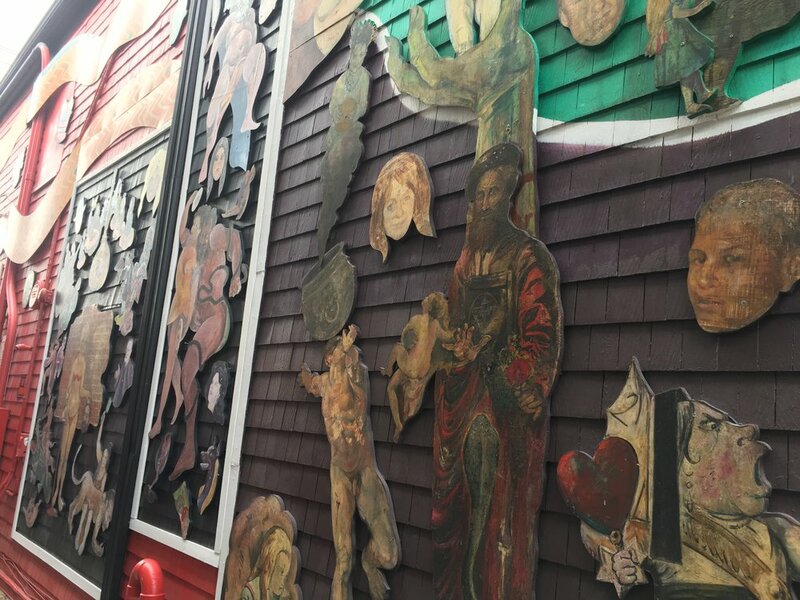 Ah, Provincetown. A beach town bustling with activity. When I arrived, it was too early to check in at my Airbnb so I took myself to lunch, where it was fun to people watch. I made my way to Matthew's place then. His apartment is not far from the pier, which would be convenient the next morning. 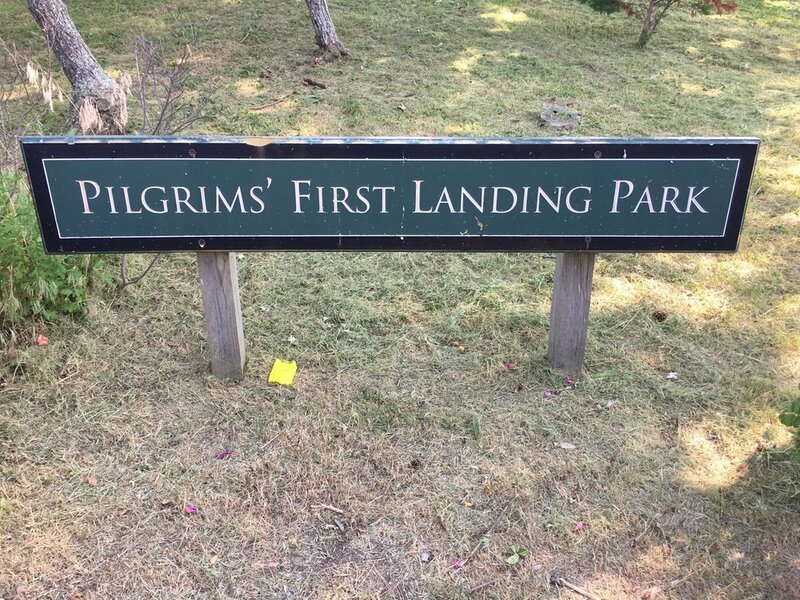 After dropping my pack off, I walked down to the Pilgrim's First Landing Park, where in 1620 those seeking religious freedom arrived on the Mayflower. The day was hot, and I walked out on the jetty to sit on some rocks and feel a breeze off the water. People were swimming and kayaking, and I just had visions from Jaws float through my head. The walk back to the center of town was a sticky one, and I found a restaurant where you could sit inside with some air conditioning. Being there on my own, I didn't stay out late, and was back at the apartment around 8 p.m. The next morning I was up early, on the lookout for some iced coffee before I picked up my ferry ticket. I found a place that also made fresh donuts, so that was a bonus! The high speed ferry ride was comfortable, with air conditioning inside. I would stare at the water, looking for a whale sighting, but also noticed how black and cold it looked. I felt homesick, and tired, but was looking forward to seeing Rachel when we docked. Rachel and I know each other from Syracuse University. She has been one of my biggest cheerleaders, in both my planning stages for this trip, and on my daily adventures as I made my way to Boston. Tim, another person from CDM Smith, was also going to meet me. What I thought would be a quick hello turned into quite the welcoming party! Rachel showed up with a giant Jenn's Journey North sign, and she had found not only Tim, but Larry, too. And there was my walking buddy Jenn, also from CDM Smith, who had walked with Mary and me to Providence! Dan and Dolores from Acadia National Park on My Mind were also there. I "met" them virtually on a Cadillac Mountain to Mount Katahdin racery.com event that raised money for both Acadia National Park and Millinocket, the gateway to Baxter State Park. Dan asked me how it felt to have these people meet me here in Boston, and I really became a little overwhelmed with emotion. Like I said, I had become a little homesick, so it really meant a lot to see familiar faces and meet new people who knew Michael, too. Rachel was gracious enough to invite me to stay two nights at her home, including the July 4th holiday. Her husband is amazing, and works a mean grill, too! A big treat during my stay was a foot reflexology session at Happy Feet. Neither Rachel nor I had any idea about what to expect, but we just rolled with the punches! The session started with pressure applied to knots in my shoulders and my back. After carrying around Lucy the backpack for so long, this was heavenly. We were instructed to lie down, and my person proceeded to press on parts of my foot that I didn't even know existed! 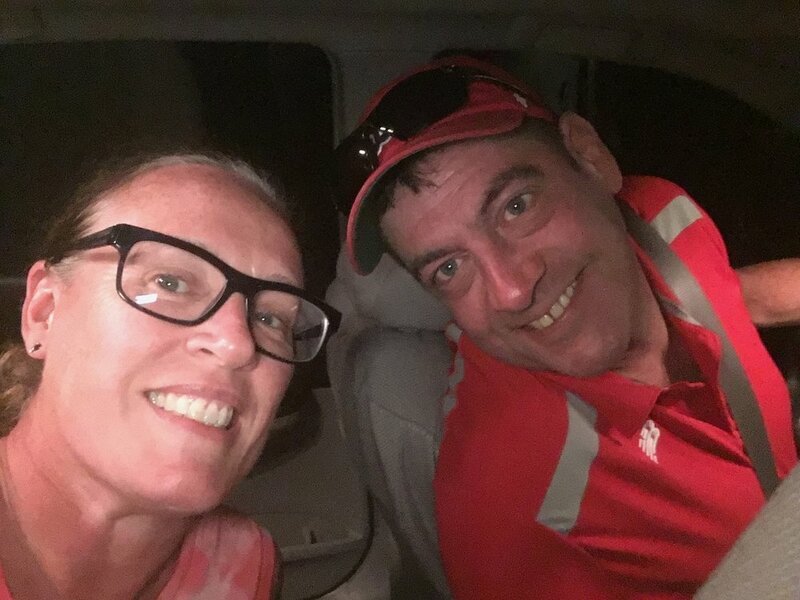 On July 5th, Rachel drove me to a town called Malden where I would start my walk. 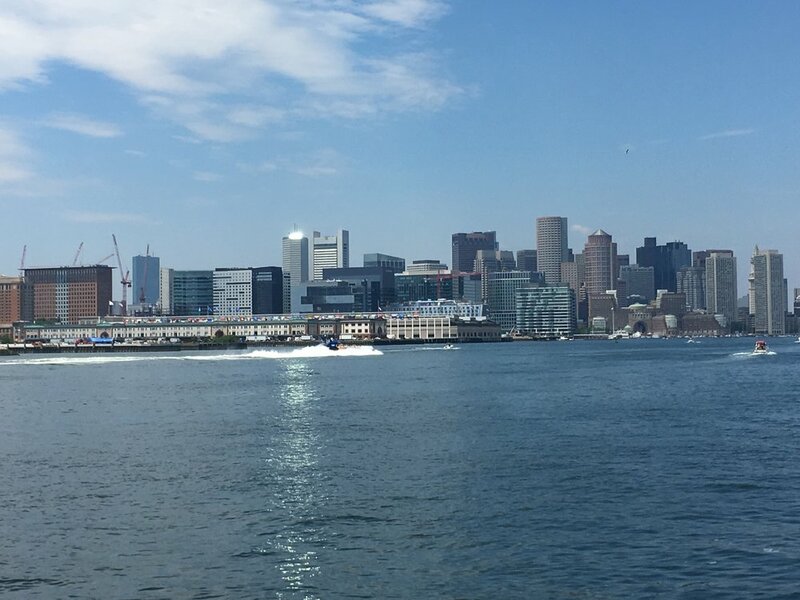 I had originally planned to start in Boston, which would mean a 22.6 mile day. It might not sound like a lot to some of my fellow Freewalkers, but the day was the hottest one yet on my trip. By the end of the 4.3 miles on the Northern Strand Community Trail I was drenched and almost delirious, and there was nowhere to sit to get out of the sun. 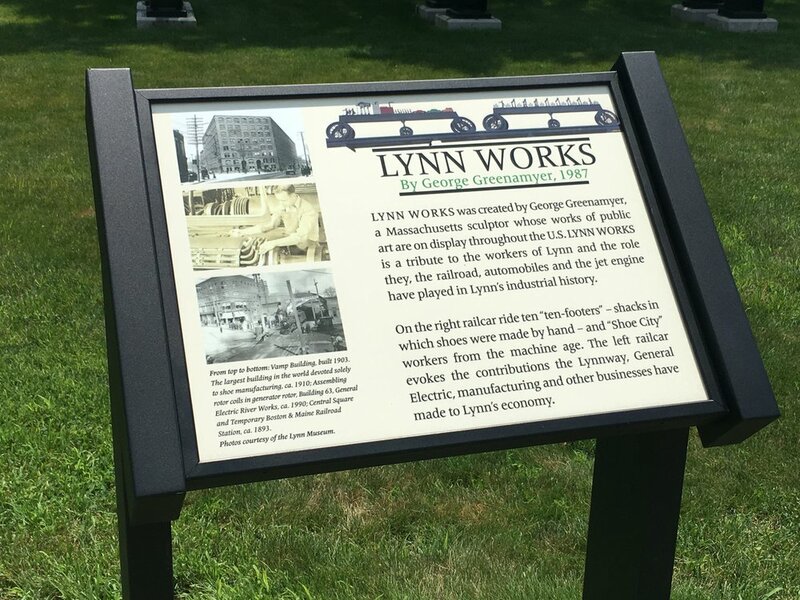 I didn't find a decent place to rest until I was near the Lynn Works, over six miles into the day's journey. Every part of my clothing was stuck to me by the time I plopped down onto a bench outside North Shore Community College, and consumed a large amount of water and lemonade. 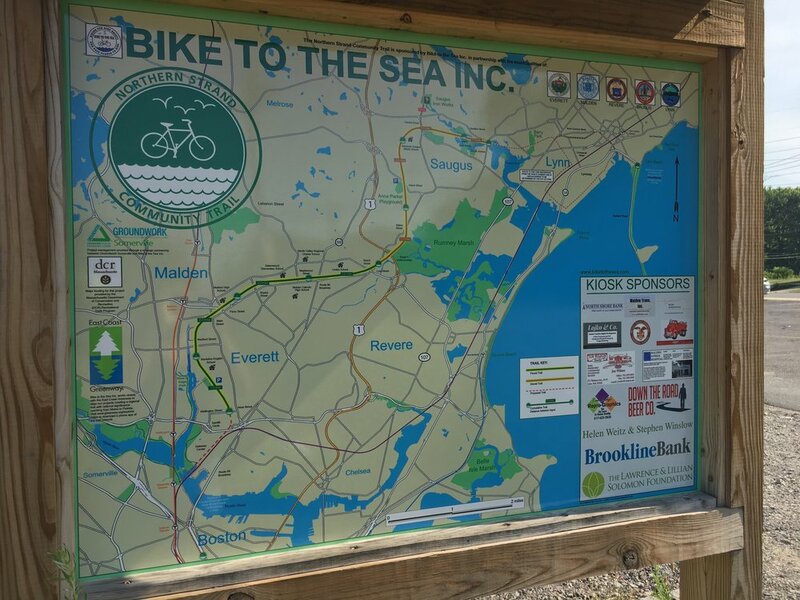 Not long after that, the greenway route hugged the coast, and there was some breeze off the ocean as I passed through Lynn and into Swampscott. The latter has some beautiful homes that I tried to enjoy seeing, but the sun was getting to me. I worried about how tired and hot I was in the ninety-plus degree weather, and I just collapsed down onto a random sidewalk to get an Uber. 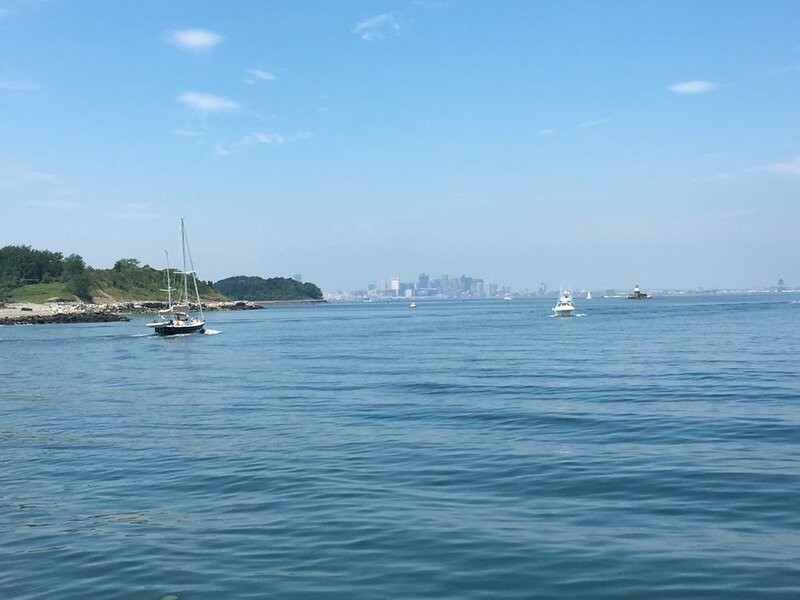 Barely a minute into the ride I saw the 'Entering Marblehead' sign. I had failed to reach my day's destination by less than a mile, but due to the overwhelming heat, I didn't regret my decision. My day was topped off by a dinner date with Tracy, Michael and Sophie. I was given the grand tour of the town, despite the dimming light, and my new young friend gave me the biggest hug as she said goodnight! 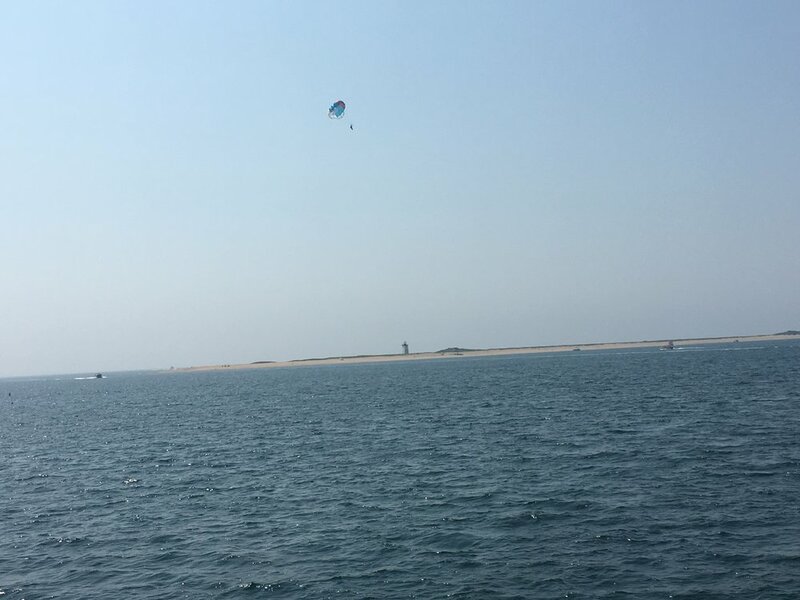 I've made it to Cape Cod! On Tuesday, I jumped ahead a little to start in Wareham to avoid walking on road with my big pack, which I have dubbed Lucy. Lucy, as in Lucy who pulls the football away from Charlie Brown. With her on my back, the goal line each day seems to get further and further because I have to walk slower. Alas, I keep going. The trek to Bourne took me on some of the best greenway yet. 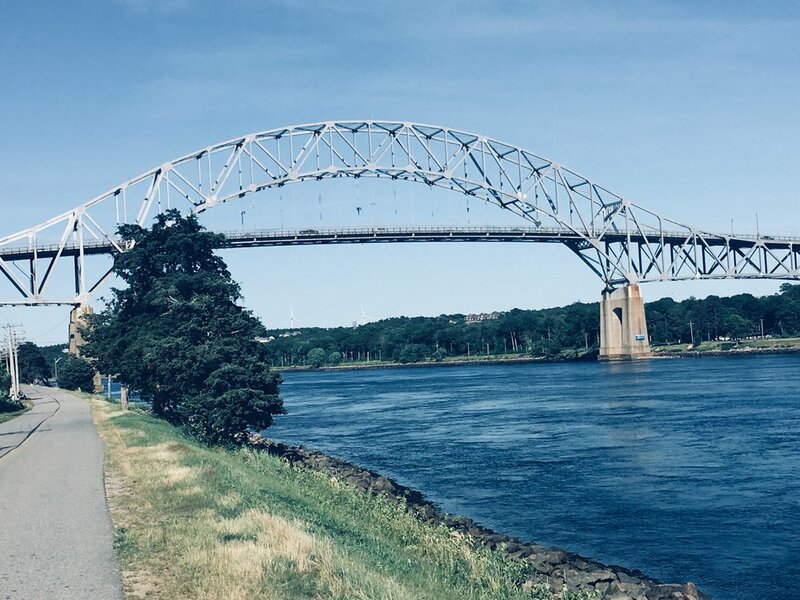 Near the Mass Maritime Academy as you turn onto the Cape Cod Canal Bikeway you're looking up at the impressive looking railroad bridge. 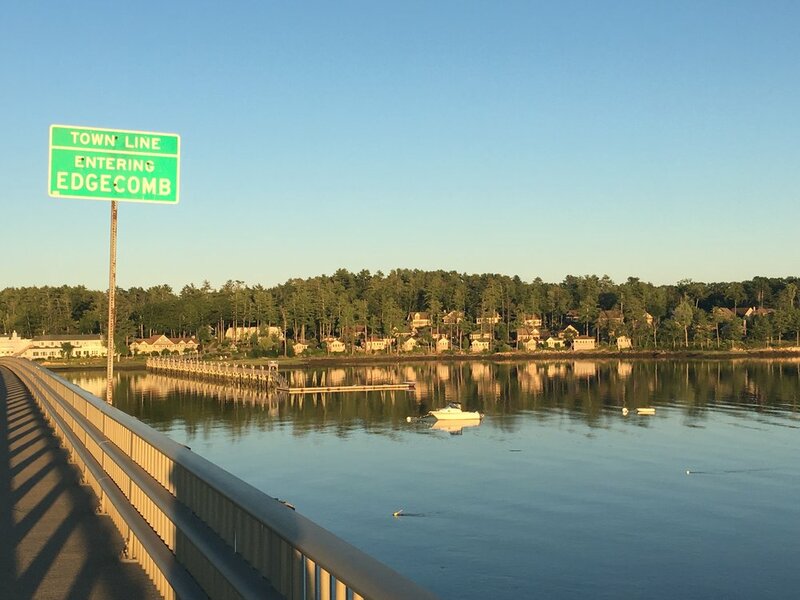 You turn left, and the path runs parallel to the water as you head towards the Bourne Bridge. The air was crisp, yet so many people were in shorts and t-shirts to my long pants and jacket. It was really a perfect afternoon. It was approaching dinner time, and my host for the night wouldn't be able to retrieve me until 7:30, so I made my way to Mezza Luna for some food. The folks at the bar were talking about driving up Mount Washington in New Hampshire, and I chimed in that I had hiked it instead. They thought I was nuts, and I learned that you get the 'this car climbed Mt. Washington' sticker with your admission. Michael and I would always snicker a little when we saw those on cars we'd pass. After a glass of wine with Kevin, I headed outside to wait for my ride with Maura. I cannot say enough about she and her family's kindness in hosting me. Instead of just the one night, I was invited to stay for two, and I accepted. 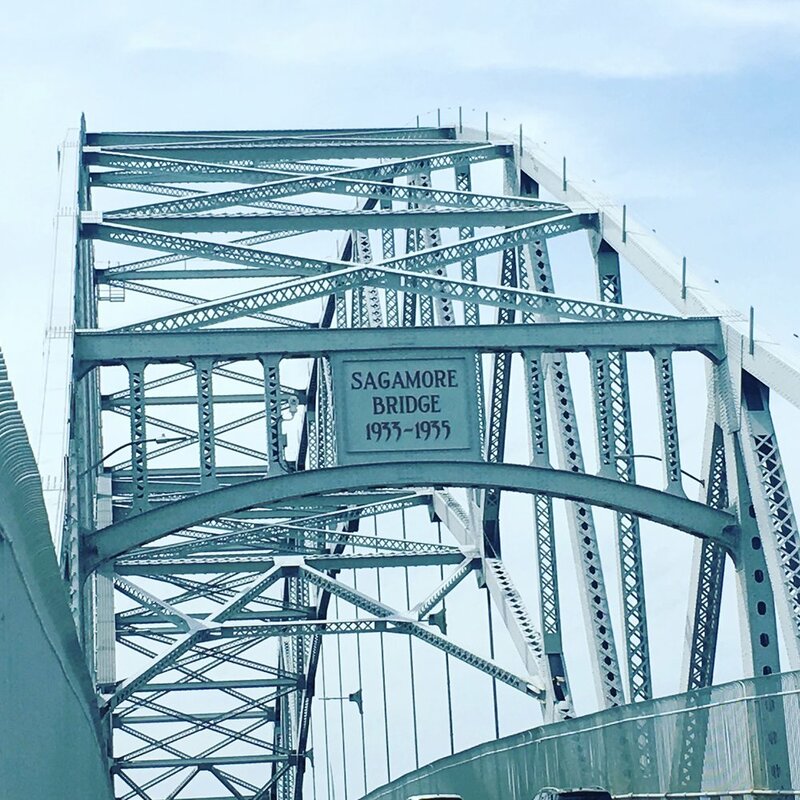 On Wednesday, Maura dropped me off near the Sagamore Bridge. 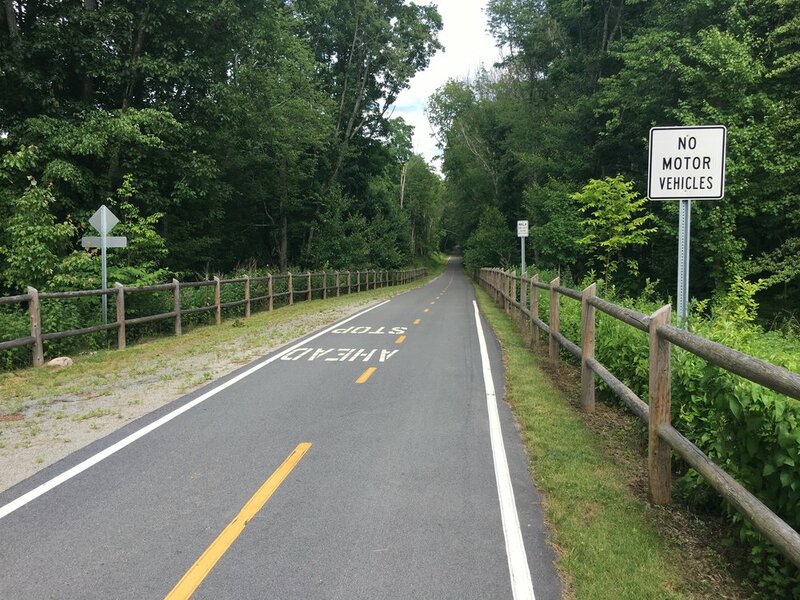 My destination was West Barnstable, with no designated greenways. The trip over the bridge kept me on my toes as cars and trucks sped by, and then the first part of the day included sidewalks and quiet streets. 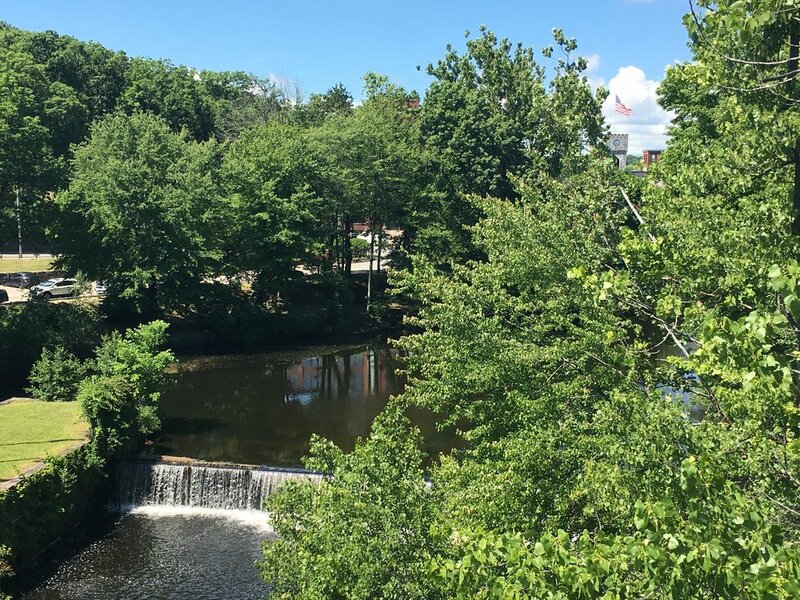 The route took me through the historic district of Sandwich, with an impressive town hall that stands next to Dexter's Grist Mill. 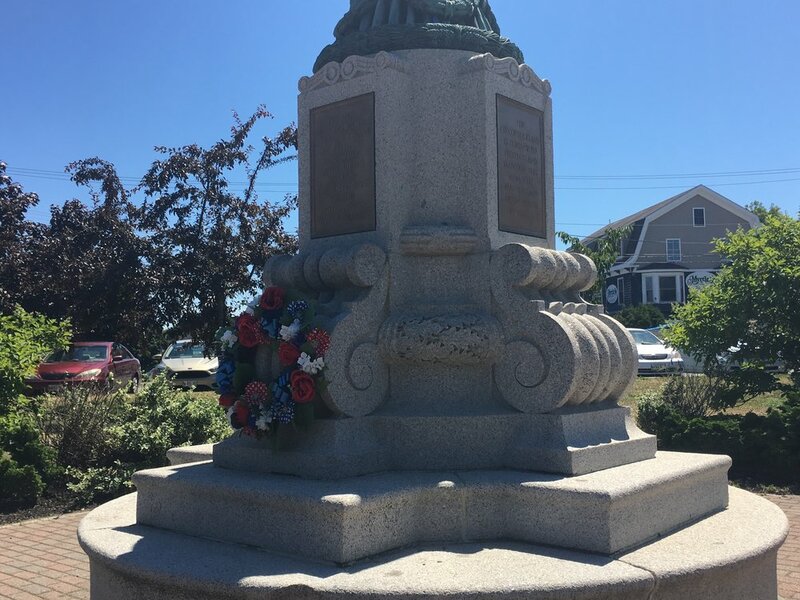 The latter part of the day was spent dodging cars with no sidewalks, and I was grateful when I reached West Barnstable's town green to await my Uber. I finished my day with a meal at Dolphin Restaurant in Barnstable Village before I headed back to Bourne. And now it's Thursday. 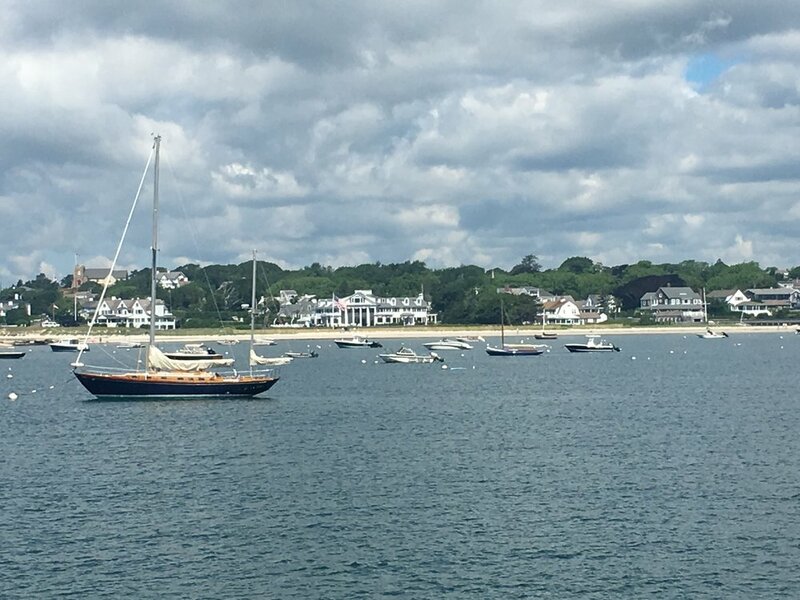 I'm supposed to be walking to Hyannis, but the forecast has called for rain and thunderstorms all day. So instead I'm waiting at Maura's for Terrie to arrive. It's cheating a little, but I'm also dry and safe. I'll pass the 400 mile mark on my way to Brewster instead! 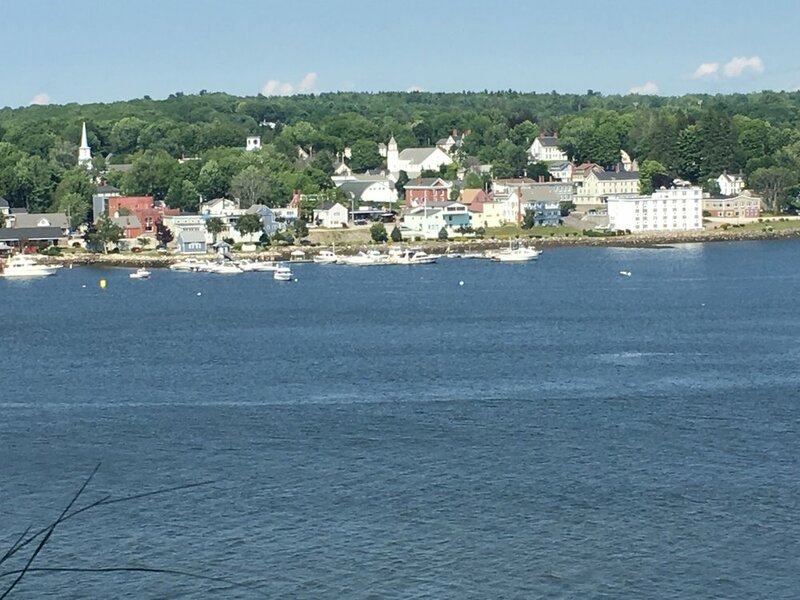 The frustration with the amount of time it took to walk through Connecticut gave way to a bit of elation when I crossed into Rhode Island. 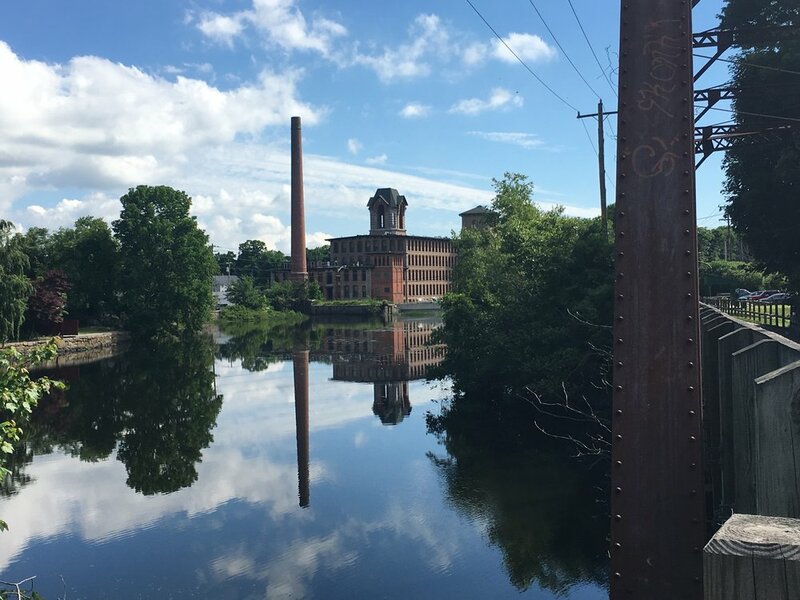 Even with my heavy pack, I couldn't stop grinning as I passed the Summit General Store, and turned onto the Trestle Trail, a part of the Washington Secondary Rail Trail that runs parallel to the Pawtuxet River. It was here that I got to rest and hydrate, and connect with my sister-in-law who would be joining me within the hour. I made it as far as Williams Crossing Road, where I sat on a bench on a perfect day, and waited for Mary. Once she found me, we threw my big pack into her car, and drove up to a lot at Industrial Drive. We walked the greenway backwards to Camp Westwood Road, and my walk for the day was complete. 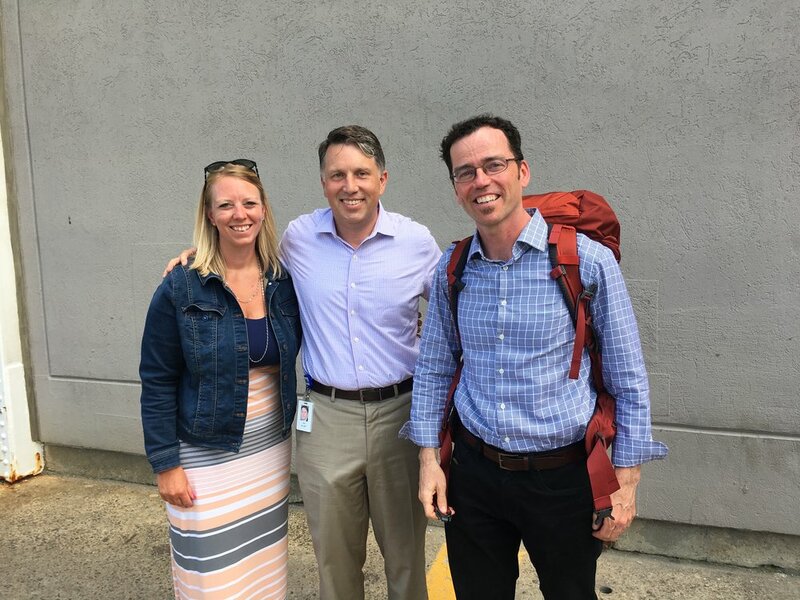 On Thursday, June 21, Mary and I started our day at that same parking lot, and we were joined by Jenn P., another of Michael's colleagues from CDM Smith, for our walk to Providence. So Jenn, Mary and I hopped back on the trail, spending a good amount of time getting to know each other, and telling stories about Michael. Conversation flowed, and since there were over eleven miles of greenway, we didn't have to worry about navigating around town. 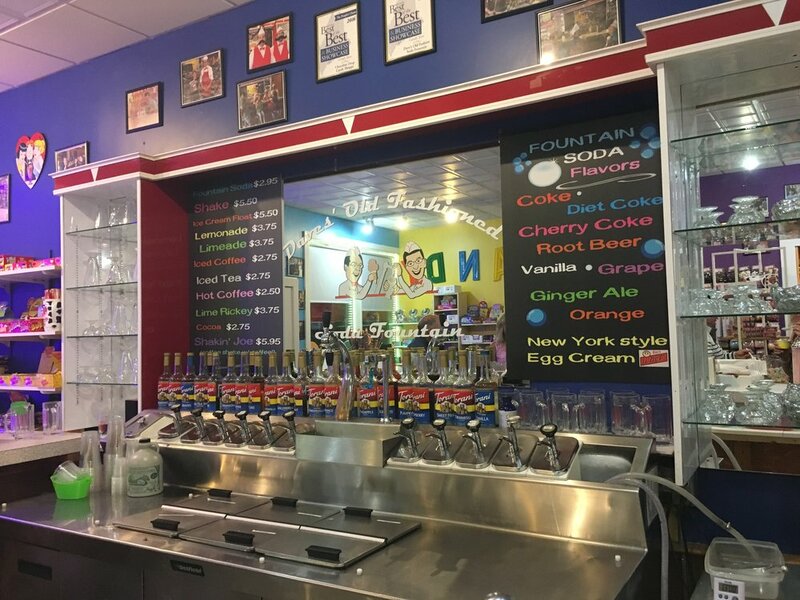 We did make a stop at a place called goalFood, located in Cranston. The smoothies we savored were jam packed with deliciousness and nutrients that kept us going all the way to Providence. 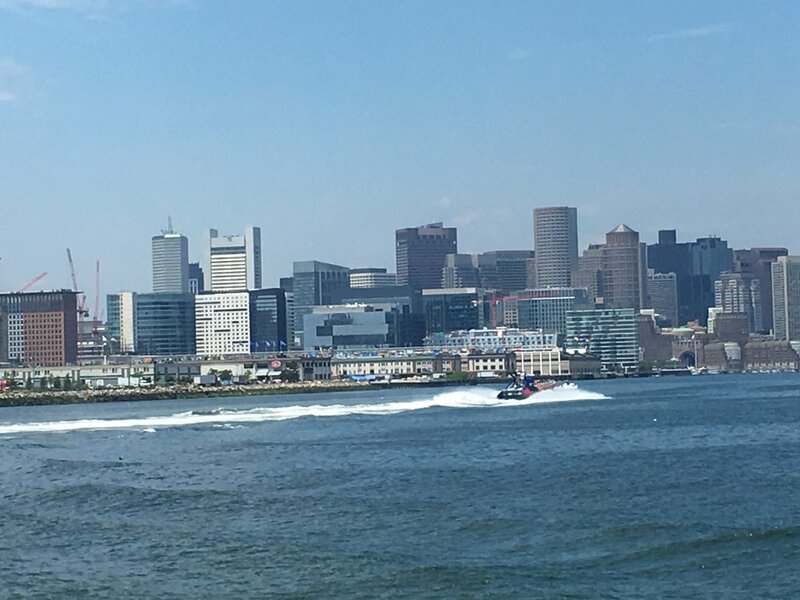 Overall we squeezed in fifteen miles, and we were happy when an Uber driver was only a few minutes away to ferry us back to Industrial Ave. I am so happy that Jenn was able to join us for this leg of my journey. 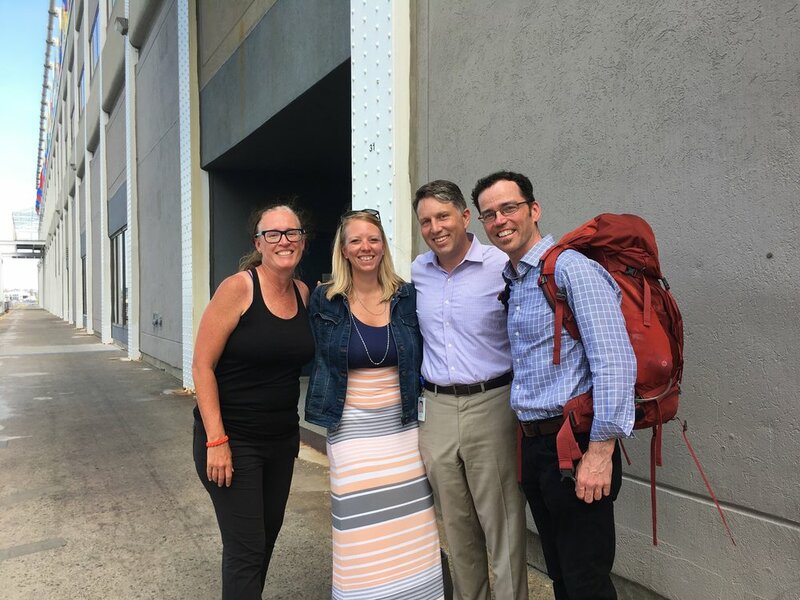 Hopefully she doesn't forget her homework assignment: taking a pic with CDM Smith peeps at an upcoming offsite meeting in Key West, where the East Coast Greenway begins! True to form, my Providence rest day included a few miles. Mary and I grabbed a quick breakfast, and toured a little bit of the town. Most impressive for these two tourists was the Biltmore, where we posed on the steps, and snapped pictures. We crossed over the Providence River, hugging the water along the Canal Walk. 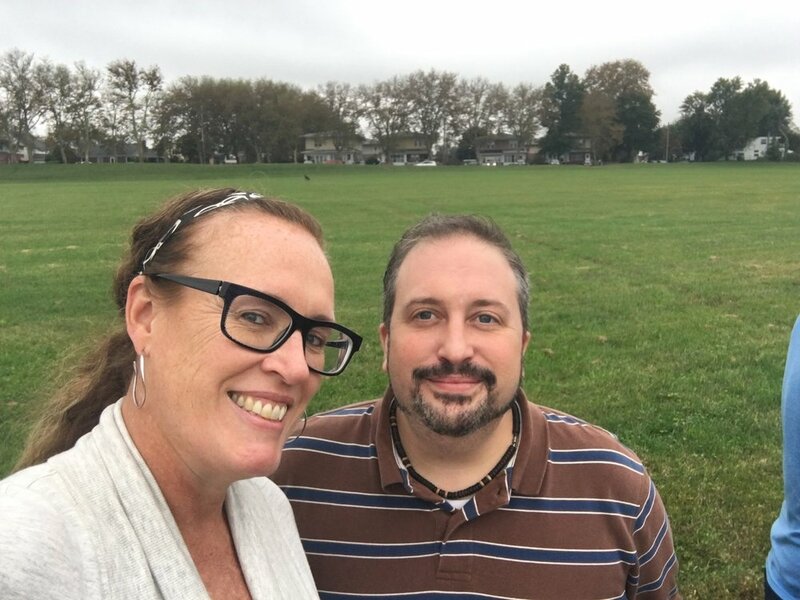 We made our way into India Point Park along the Seekonk River, then finishing up at a point on the Blackstone Boulevard Walking Path that had just been paved. Our shoes had had enough of tar filling the grooves on our soles, so we called mercy, and opted for a lunch break. 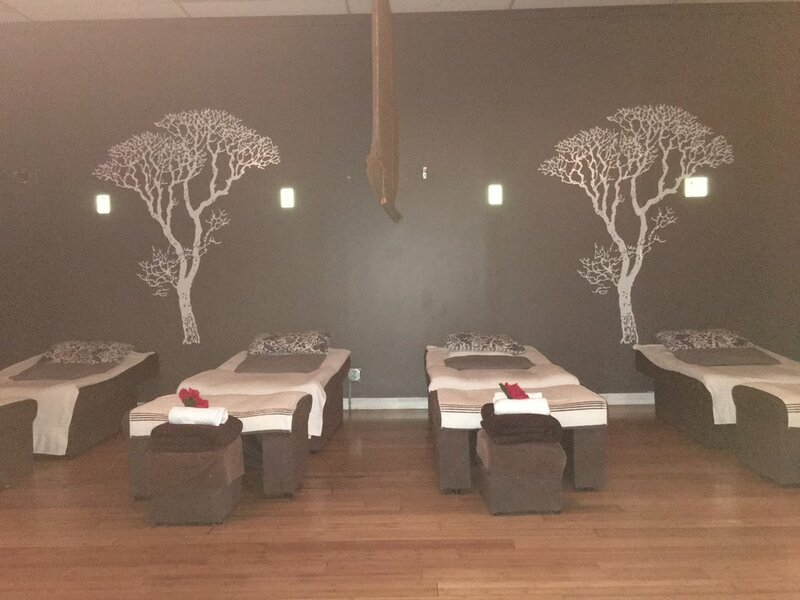 Nina had graciously arranged for me to get a massage that afternoon, but while we were still eating, my phone rang. The spa informed me that the person with whom I was to be paired was waiting for a tow truck. Alas, no massage. This particular Friday marked two years since that fateful day in Gouldsboro, Maine. Sitting with Mary over dinner, the conversation turned to our old tradition of ending the work week with a cocktail, Michael with a martini and I with a glass of wine. I miss that ritual, so Michael's baby sister stepped up, saying, "Bartender, a martini over here!" Mary and I rallied, and started early Saturday for our walk into my next state, ending at Fall River. 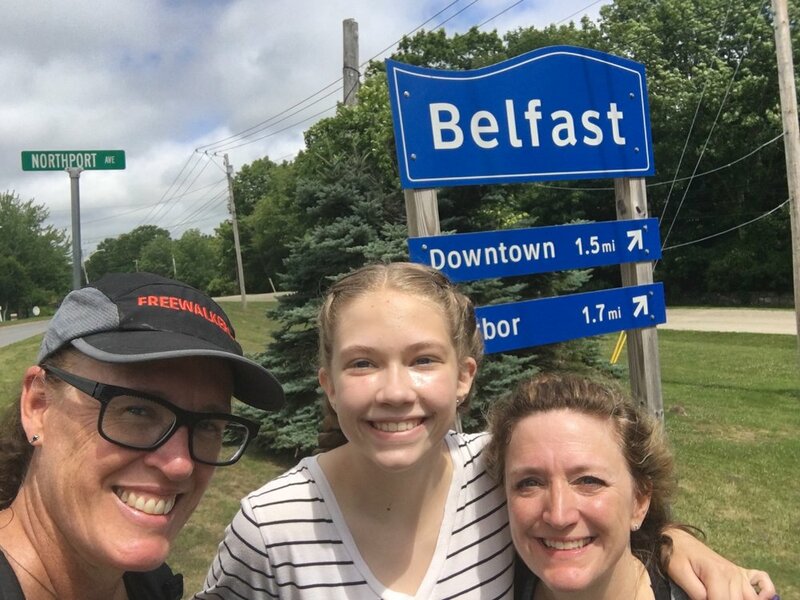 We were lucky that there was only a light rain for the first part of our trek, and it couldn't stop our glee as we saw the 'Welcome to Massachusetts' sign early on. The rain stopped and we continued on, finally finding the pedestrian path running along Route 6. 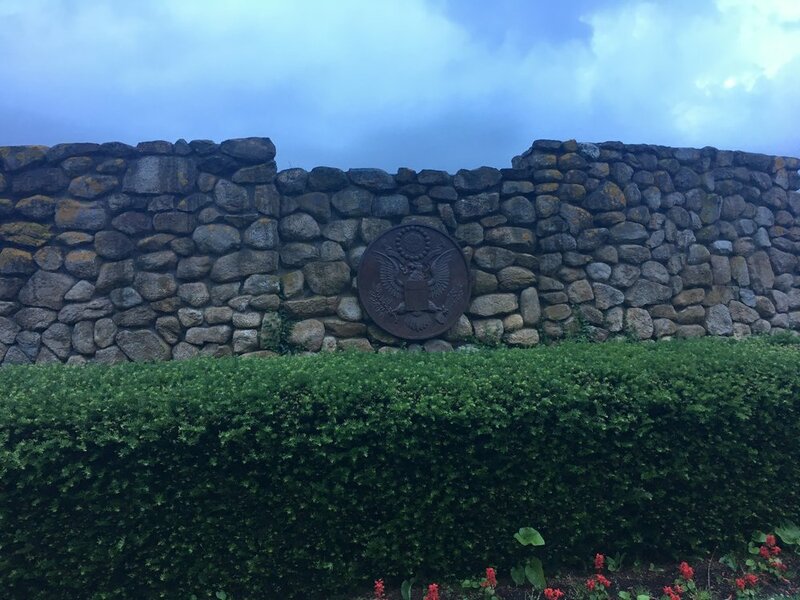 We made our way into Bicentennial Park, and admired the craftsmanship of the replica Iwo Jima monument that overlooks the water. 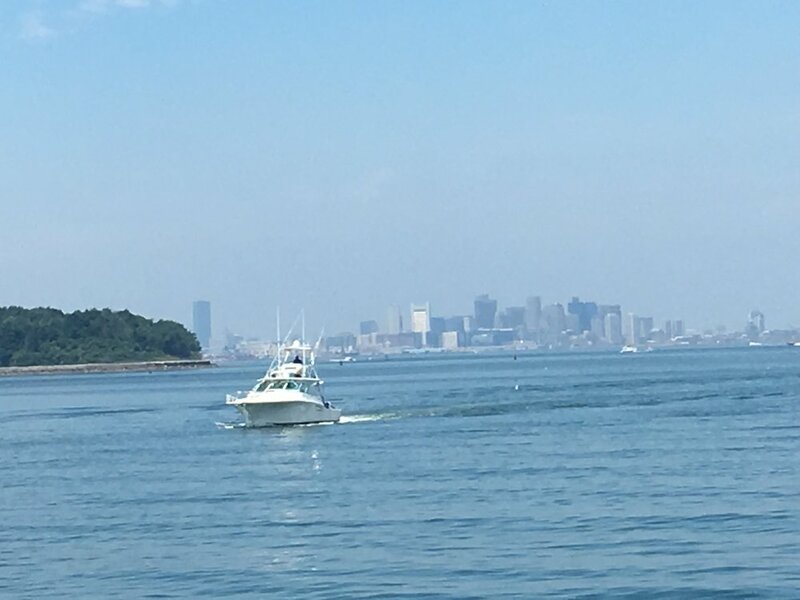 We kept moving, heading towards the USS Massachusetts battleship that we would end up touring after a lunch that hit the spot. 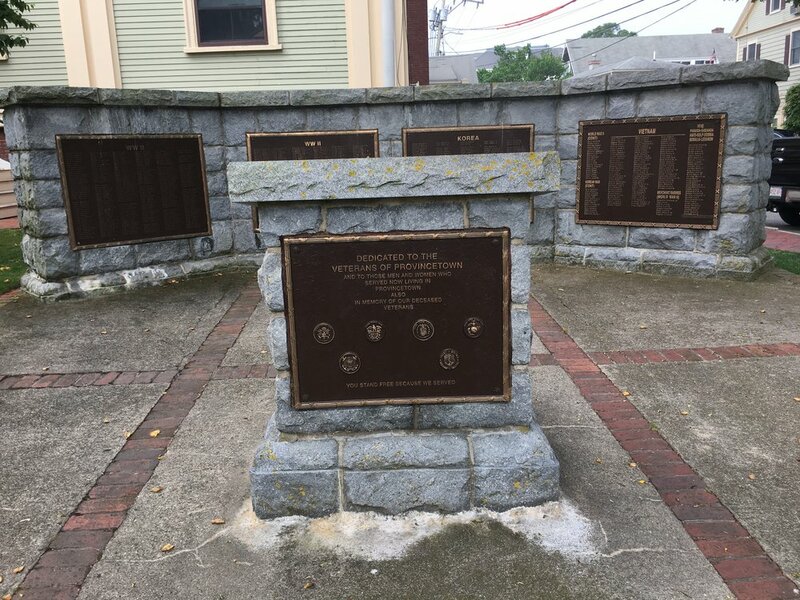 If you make it to Fall River, it's worth your time to do the tour; you'll walk around battleships and a submarine, and be amazed by the amount of history here. Our bellies full and legs tired, we drove to our Westport Airbnb and met Bill, our host. 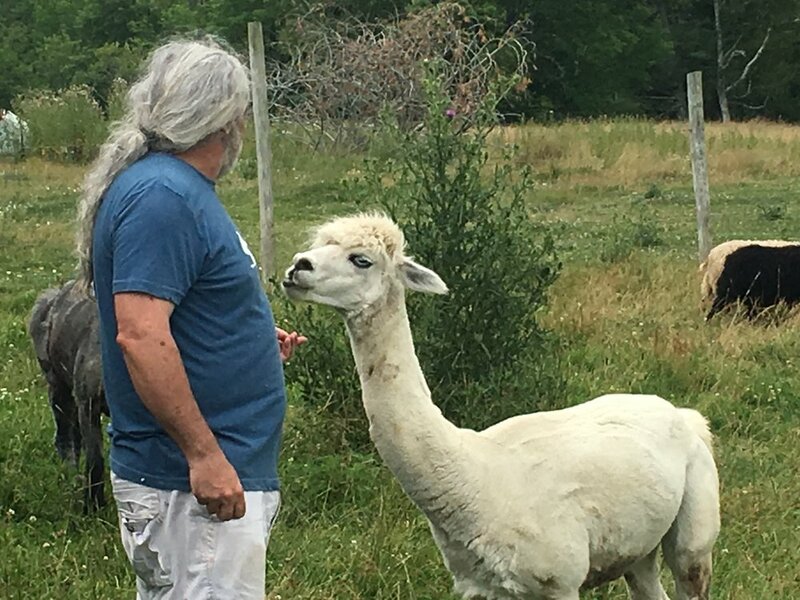 The topic, of course, as to why we were there came up; as I relayed a bit of my itinerary, Bill's ears perked up when he heard that I would finish in Gouldsboro. 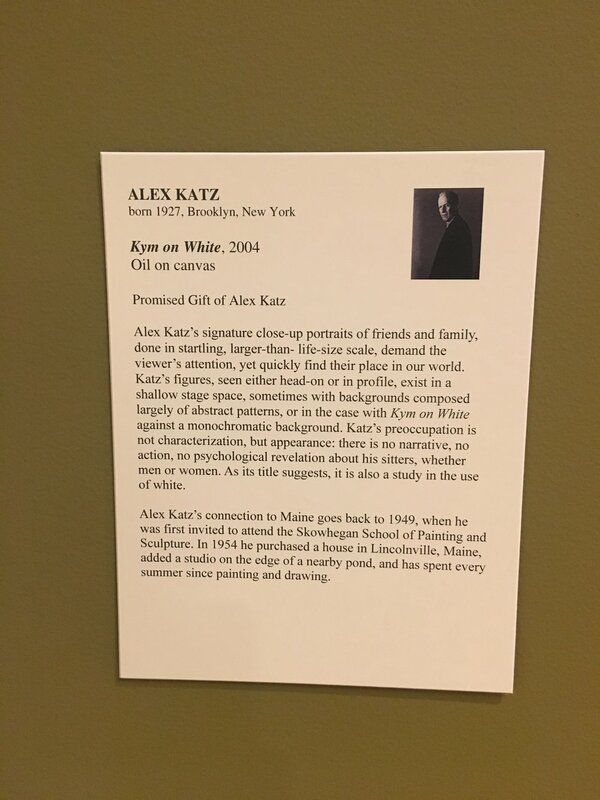 It turns out that his family has a home in the area, and he knows Jane and Kelly of Littlefield Gallery. 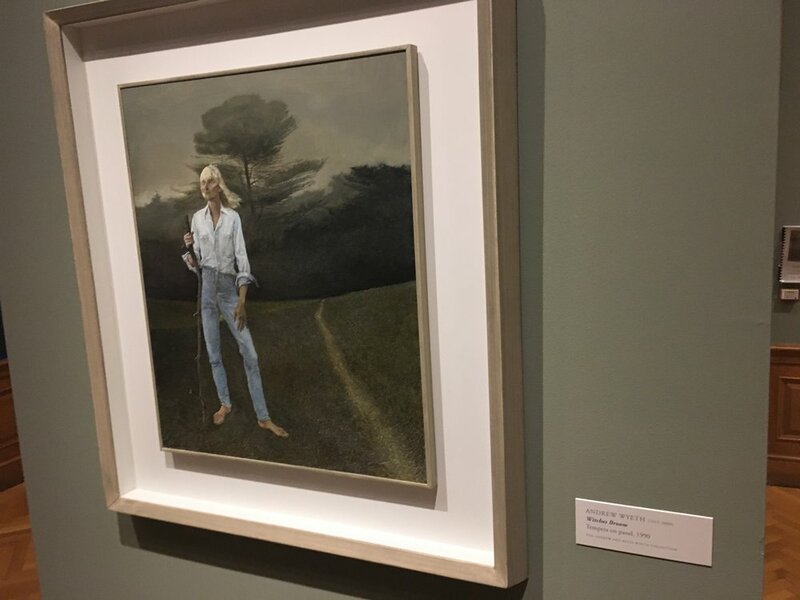 In fact, we were staring at a beautiful James Lineham painting that I recognized from their collection. I guess there are certain people you are destined to meet in this world.